I have an affinity for the USA. My parents lived there for over 21 years. Accordingly I have been there many times over the years. It is a land of vastly different landscapes, including may different mountain ranges – the Appalachians in the east, the Rockies of the mid west, the Sierra Nevada in California and Nevada, and the sub-sets of those. One lesser known range is the Cascades which run from northern California up through Oregon and into Washington State. For most of the length of this range it is dominated by a series of volcanoes. 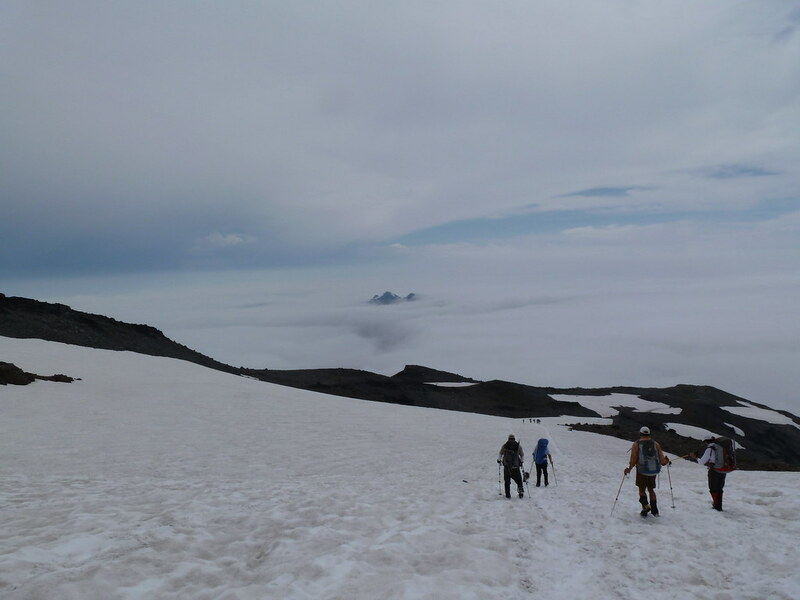 Two years back I posted a TR of my ascent of Mount Hood, one of the Cascades’ volcanoes in Oregon. 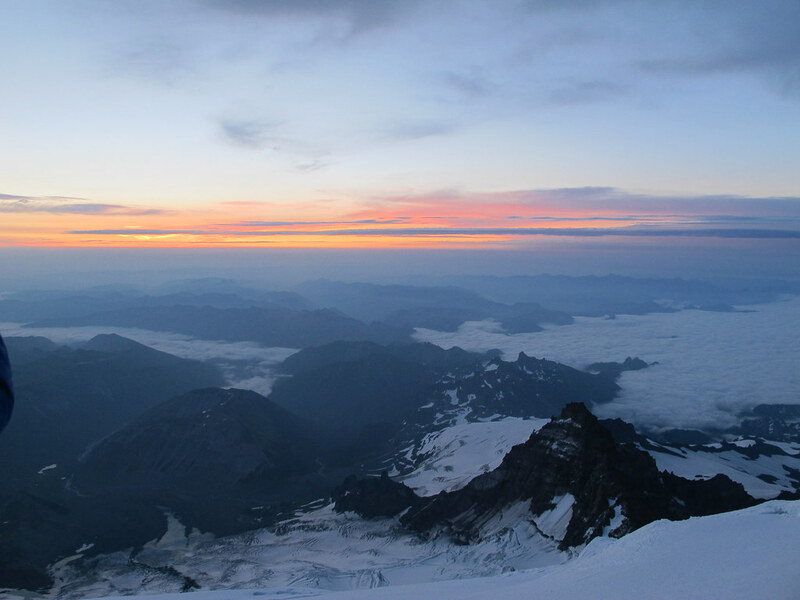 Standing on the summit of Mount Hood at dawn, Mount Rainier could be seen over 100 miles away to the north. 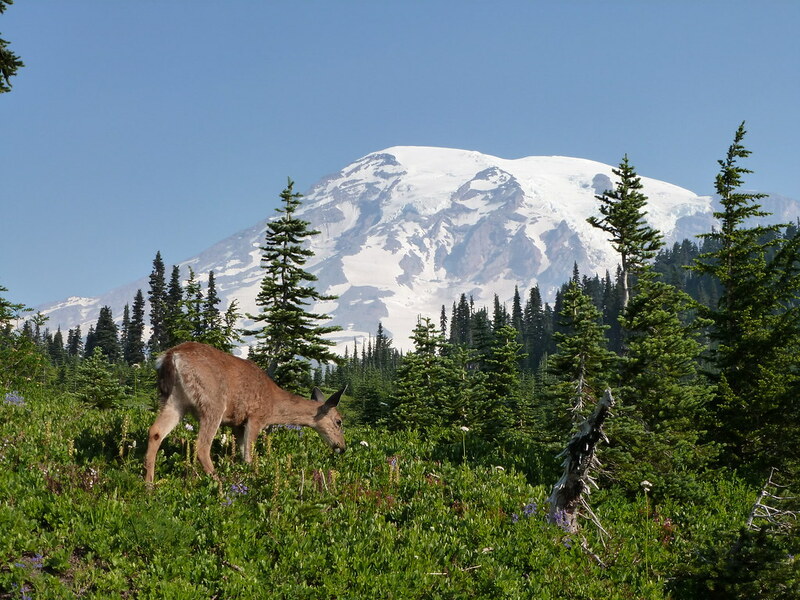 Mount Rainier is an iconic mountain. It dominates the skyline of Seattle some 50 miles away (assuming the clouds let you see it). 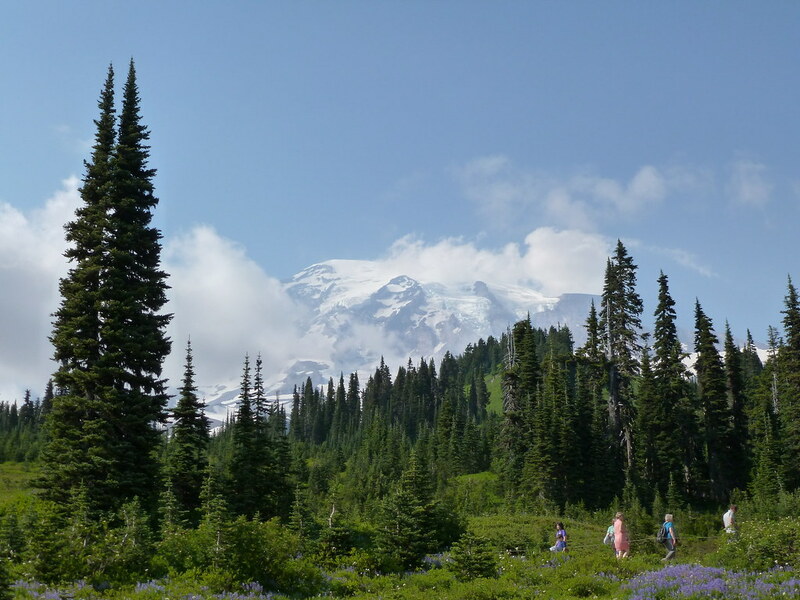 Mount Rainier is perhaps the single most impressive mountain in the 48 contiguous United States. 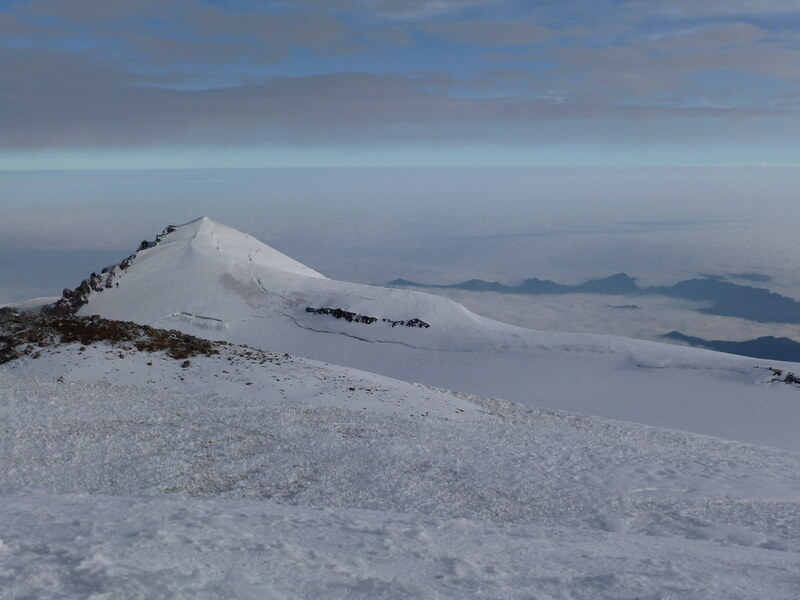 It ranks fifth in height (but is the highest US volcano) at 14,411ft. But no other peak in those 48 States has the combination of high elevation, massive bulk, and extensive glaciation (there are more than 35 square miles of glaciers and snow fields). Even by its easiest route, Mt. 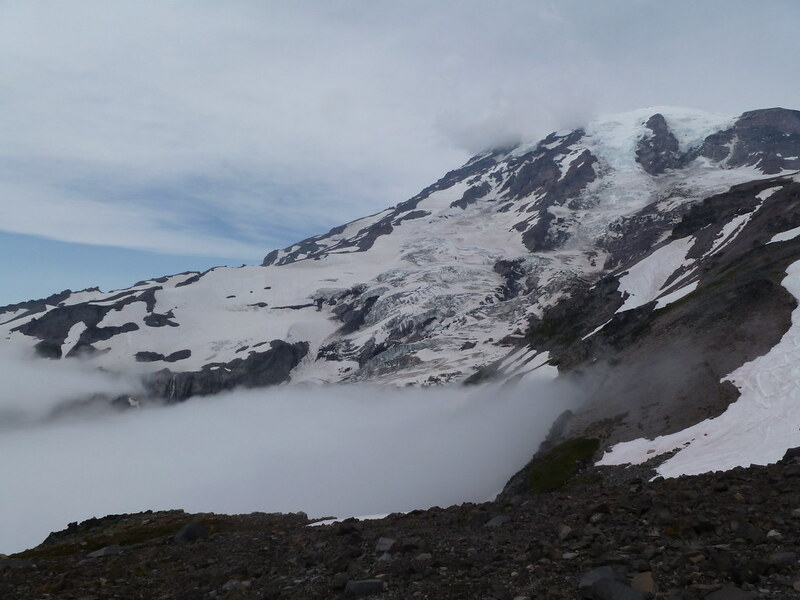 Rainier requires ascending over 9000 vertical feet. This distance is the same as for the climb from advance basecamp in the Western Cwm to the summit of Mt. Everest. Even though Rainier’s elevation is low by the standards of the Himalaya and the Andes, there are only 20 mountains on earth have more topographic prominence –it just beats K2 for spot number 21 on the list of most prominent peaks on earth. A climbing permit is required to climb. 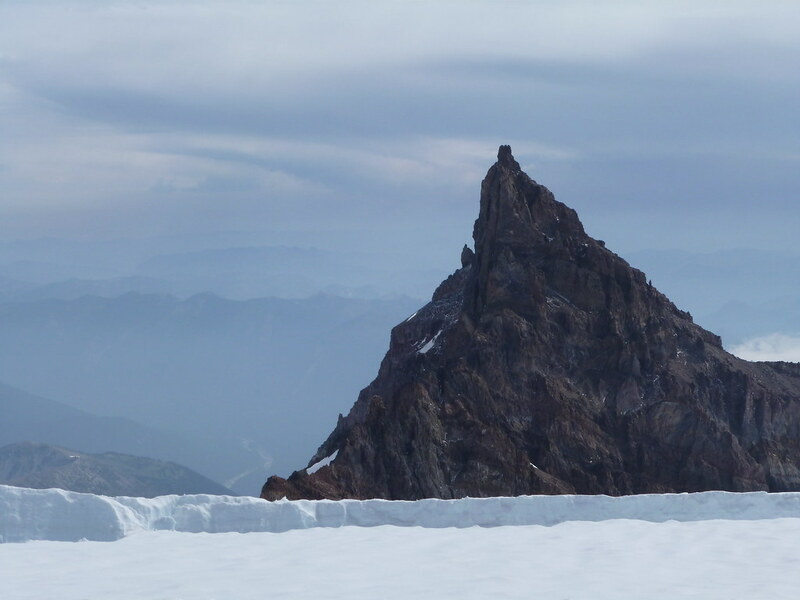 Over 10,000 permits are issued each year but the success rate for reaching the summit is a little over 50%. 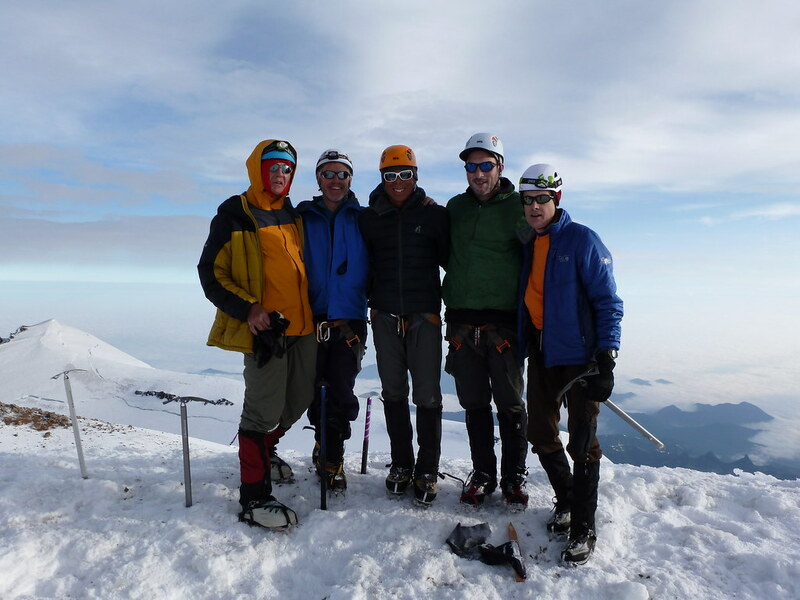 I had been looking for a step up in challenge after Mount Hood. 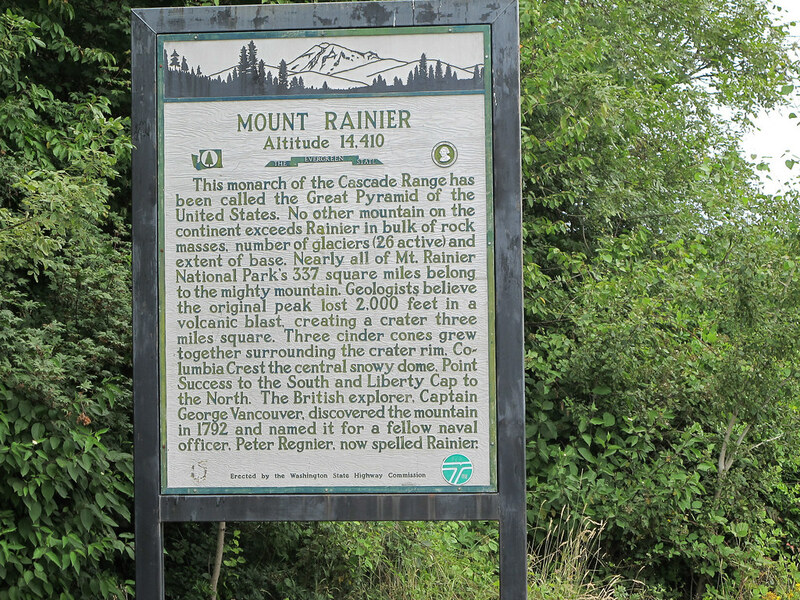 After extensive research, Mount Rainier seemed appropriate. It also meant an attempt at another state highpoint (yet another tick list I am afraid). The next trick was to determine how to attempt it. The simplest option (if not cheapest) was to use a guiding company. I was fortunate that I had accumulated loads of airmiles, which meant that the cost of me getting there was not an issue. So the cost of a guide became less of an issue. So, with no-one to accompany me on this trip I decided to join a guided group. 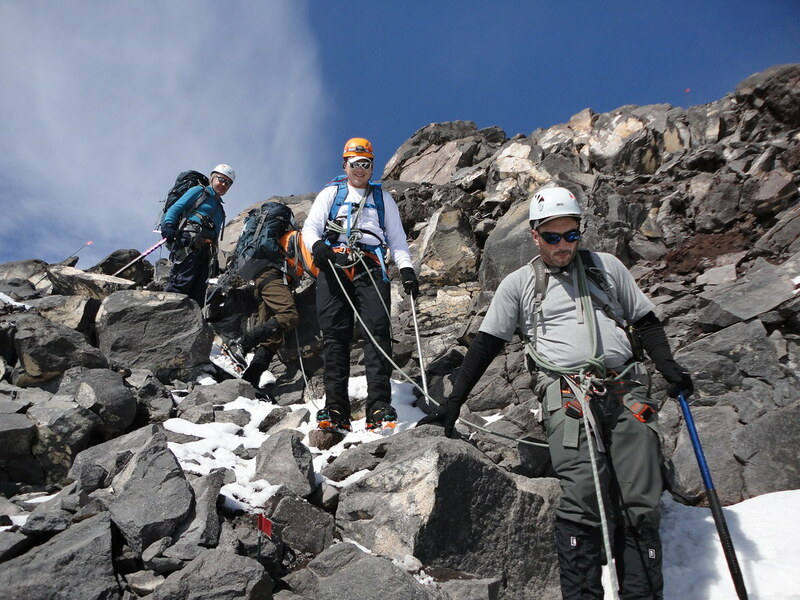 There are three companies which principally have permits to take paying customers on an ascent, plus a number of others who obtain one off permits, normally not on the most popular route. Whilst the summer climbing season runs from May thru September, the popular dates book up very early. I was lucky to obtain my date for the end of July back in January (it was the last spot), though cancellations do occur such that spaces do open up later. The guiding company I used was to be RMI which is based in Ashford near the base of the mountain. July and August tend to have the most stable weather in this part of the world. Having spent my money with RMI, I now needed to get fit enough to ensure I would have a decent shot at the attempt. I also decided to spend a week in Colorado en route to assist both with fitness and acclimatisation. I have posted separate TRs for the four ascents I undertook in Colorado. So from February through to my departure to the US towards the end of July I concentrated on fitness by joining a gym and undertaking quite a few trips to the Highlands. 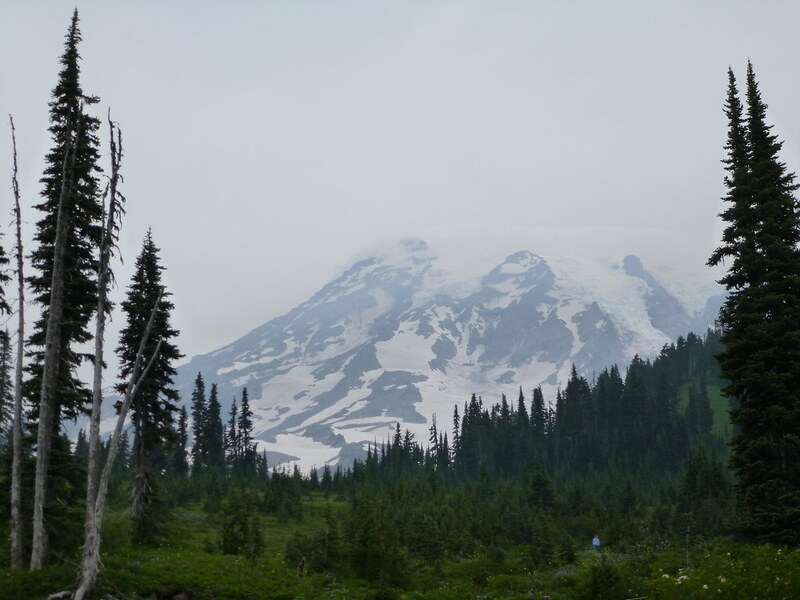 The focus on Rainier gave me the necessary incentive (not that I needed much incentive to go to the Highlands). During the fitness regime I lost (a much needed) 10lbs and did, indeed, feel much fitter than I had been for several years. So I arrived in Seattle on 28th July, the day before the programme with RMI was due to begin. Unfortunately I had done some damage to my right calf muscle which meant that I was limping and in some pain as I collected my bags and picked up my little rental car. So I was somewhat concerned that all the effort I had put in would come to nothing. The photos in this report are a combination of some taken by me, Mike Doyle and Ryan Will. Mike and Ryan were in my climbing group. So I duly acknowledge and thank them for their contributions. A larger set of photos are available to view on Flickr. This is also a rather long report so I suggest you (a) get yourself some refreshments (b) go to the loo or (c) give up now. NO! I take that last option away – stick with it please. It’s different! 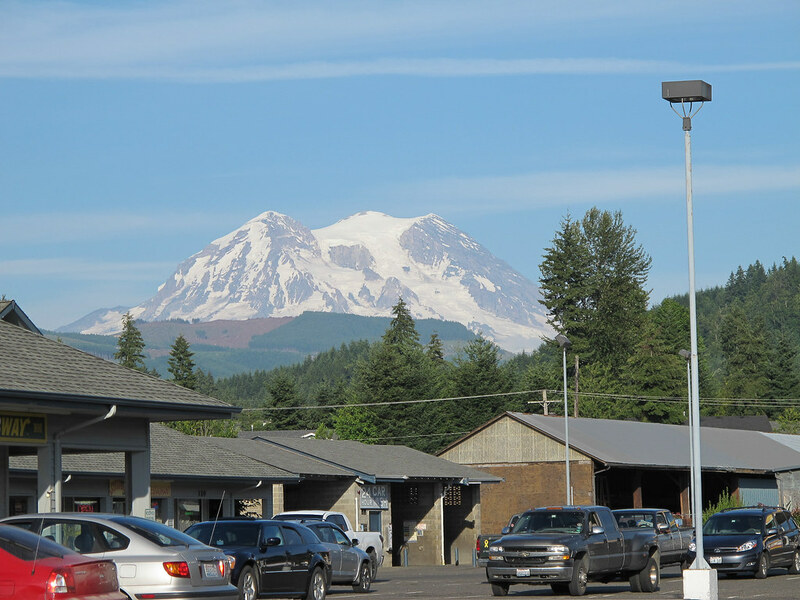 So having visited a supermarket to stock up on food I drove to Mount Rainier. The mountain stands in its own National Park, the fifth national park to be established in the US. I had pre-booked a site in the Cougar Rock campground before my departure from the UK, so I went there and was established by the evening. It was a gorgeous day. Paradise was living up to its name. Beneath a layer of marine cloud had drifted in. 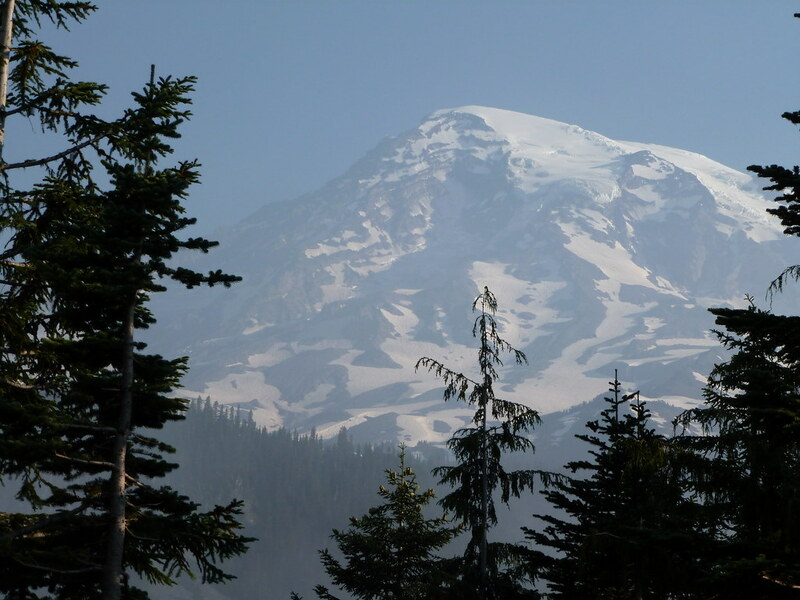 Rainier stood proud, high and forbidding. It dripped with glaciers, ice and snow. I scanned it slopes in awe. The mountain is in a different league from Mount Hood. I spent a while wandering/hobbling around. The air was cool, mountain fresh. 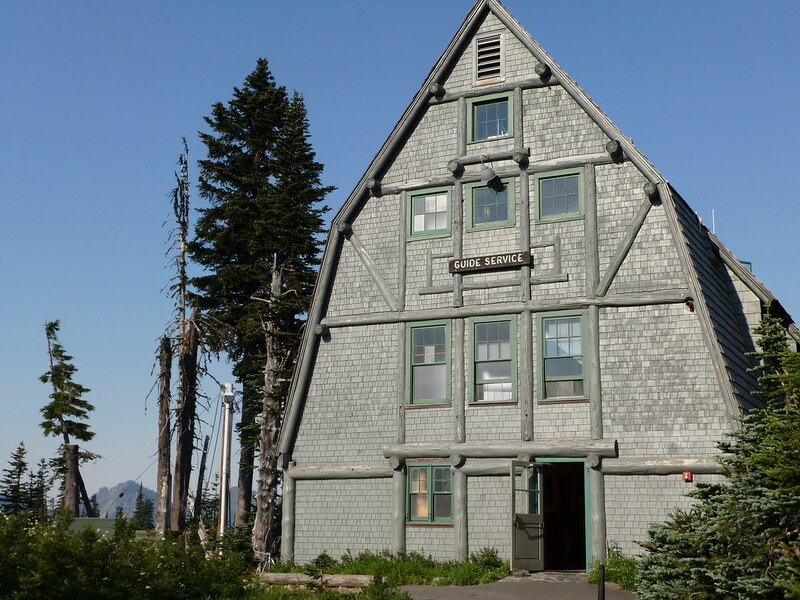 I looked inside the Guide House where there was a small exhibition on the climbing history of Rainier, a weather forecast (not promising) and a helpful National Park Service ranger. This is where climbing permits are issued, but RMI would organise this for our group. The sun rose in the sky. Rainier still reigned supreme. RMI advertise the climb as a 4 day climb. The first “day” is an afternoon involving a kit check, a presentation by one of the guides on the current state of the climb and meeting the rest of the group. There were 18 clients who would be divided into two groups of nine. Each group would have three guides – therefore a client guide ratio of 3:1. So the first “day” was not too taxing then! That evening I ate with a couple of my group at the motel in Ashford I would be staying at that, and the next, evening. Day 2 comprised a “snow school”. This is where we went through ice axe arrests, crampon techniques, rope work, use of avalanche transceivers, rest stepping, pressure breathing etc. For some this was new; for others it was more of a reminder/refresher. Two of the three guides who would be with my group on the climb, Brent and Steve, looked after us on day 2. One of our number dropped out on this day, having damaged her back putting on her heavy rucksack the previous evening. Normally, the snow school is held about 15 minutes’ walk from Paradise. 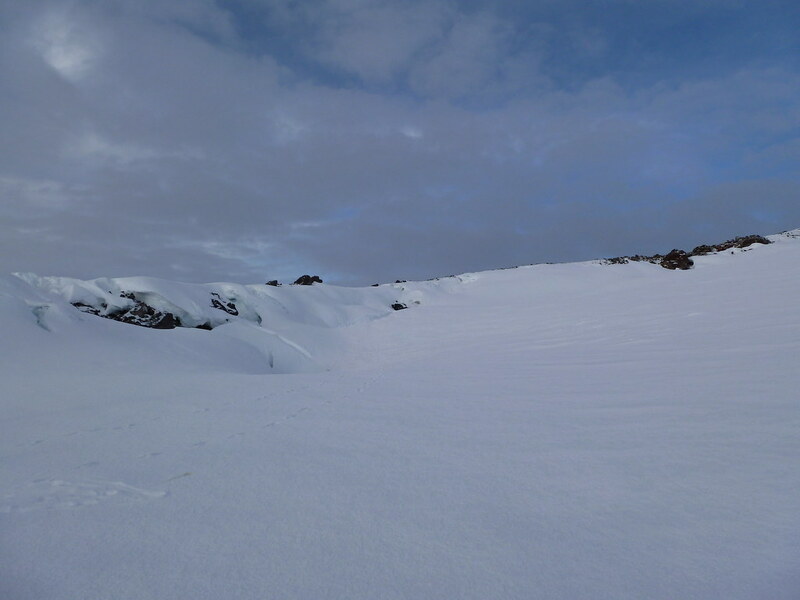 But this late in the season, the snow had receded and we had to walk 1¼ hours to find a suitable spot. But we had fun sliding around and soaking up the rays. At the end of the day though, the weather showed distinct signs of turning. Cloud was building up. The leg was a bit sore again on day 2. So it was treated to anti-inflammatory pills and a soak in the bath before a final pack of the rucksack in anticipation of the next two days of adventure. The forecast seemed, unfortunately, to be right. We undertook last minute checks and were introduced to our third guide, Katrina, and drove up to the start. By the time we reached Paradise at around 11.30am the cloud was well and truly down. It did mean that the temperature was cooler than it had been over the previous two days. Carrying the heavy packs, that would be welcome. If anyone is interested in the kit I was carrying then they can ask in any comment they make. But this post is becoming long enough already so I will not list it here. 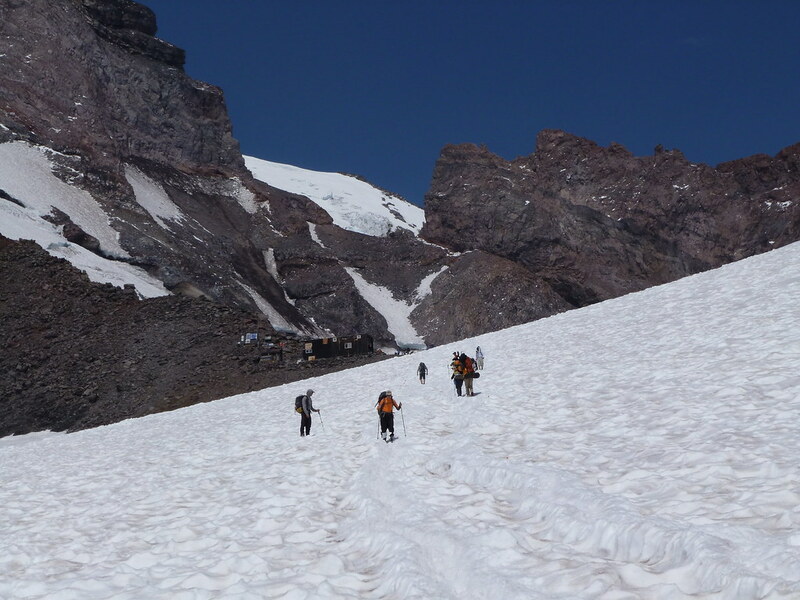 The objective for the day was Camp Muir at 10,100ft. This would involve 4,700ft of ascent and take around 4 hours. The first 1½ hours were on regular trails and the remainder of the time would be on snow. Our group (now of 8 clients) would be led by a guide who would set the pace; the second group of nine followed with their guides. There would be stops every hour for food and drink. 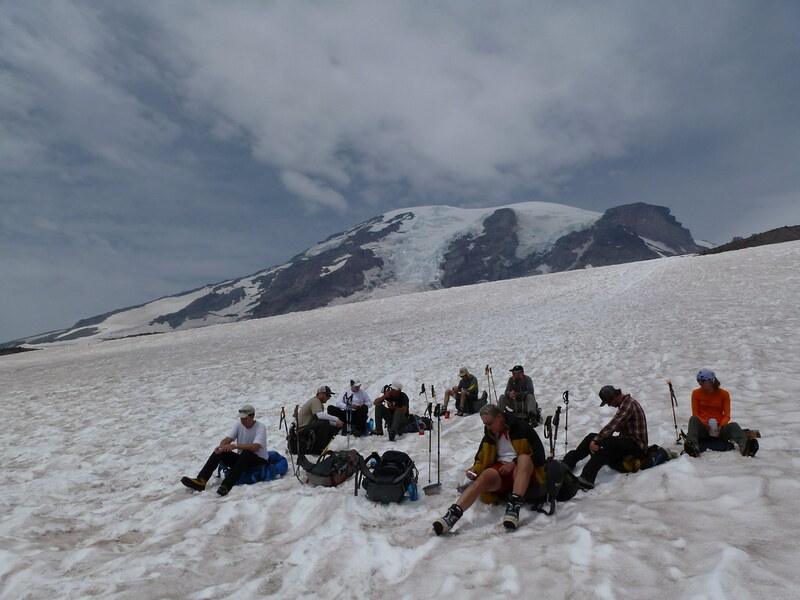 Our first stop was just below the snowfield – The Muir Snowfield. Of course the “Muir” in the name is John Muir, the famous environmentalist. 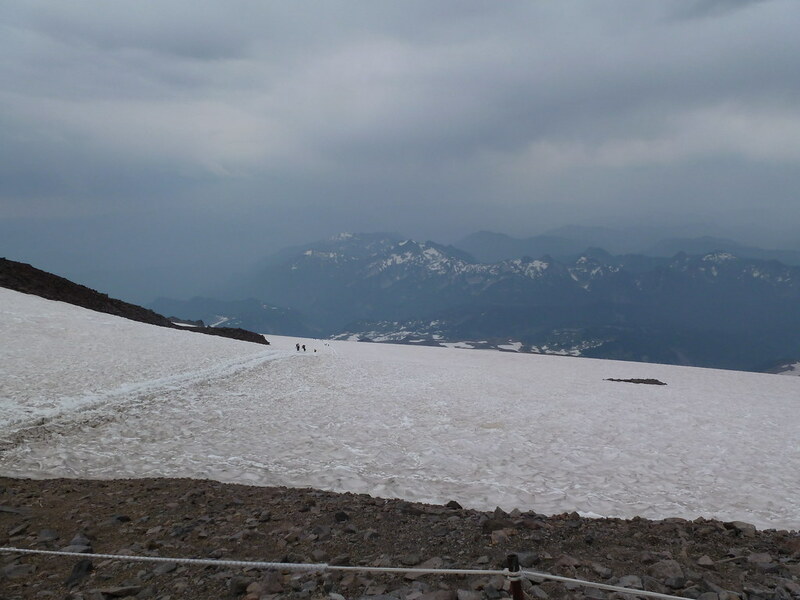 Here is a view up the snowfield from our second stop. And our group settled at our second stop. It was good, indeed I would say essential, to get into the discipline of having these stops to ensure that energy and hydration levels were maintained. You did not want to become debilitated higher up the mountain by failing to do this. 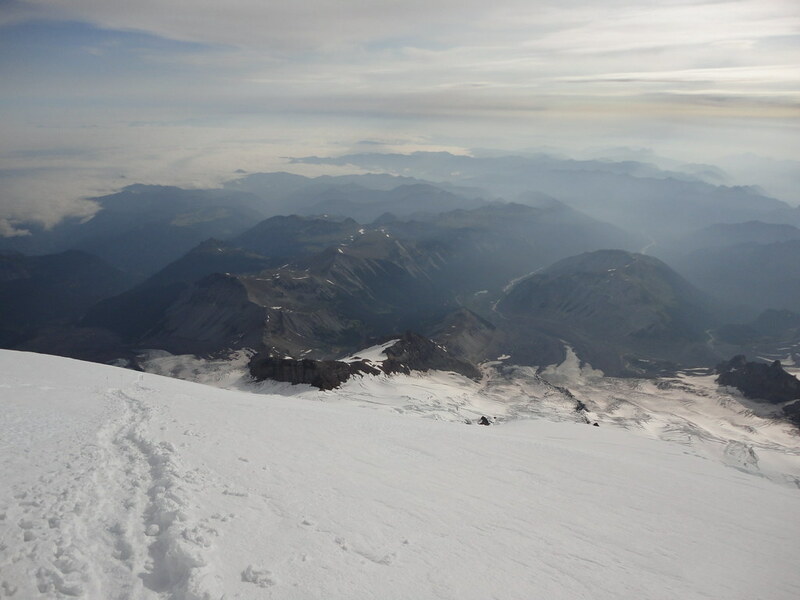 This snowfield has no objective dangers and is never very steep. So we were not roped up and remained in single file behind one or other of the three guides who set the pace whilst the others watched on and assessed how we were performing. The cooler weather meant also that the snow was not too soft. So progress was good. 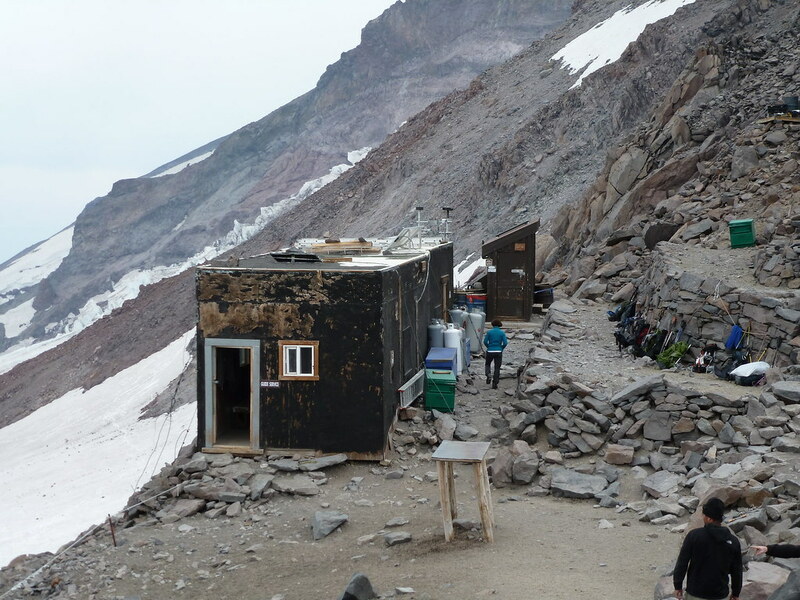 At our third stop we were briefed on what we could expect to find in terms of facilities at Camp Muir and what the timings were likely to be in terms of sorting ourselves out for our stay there. 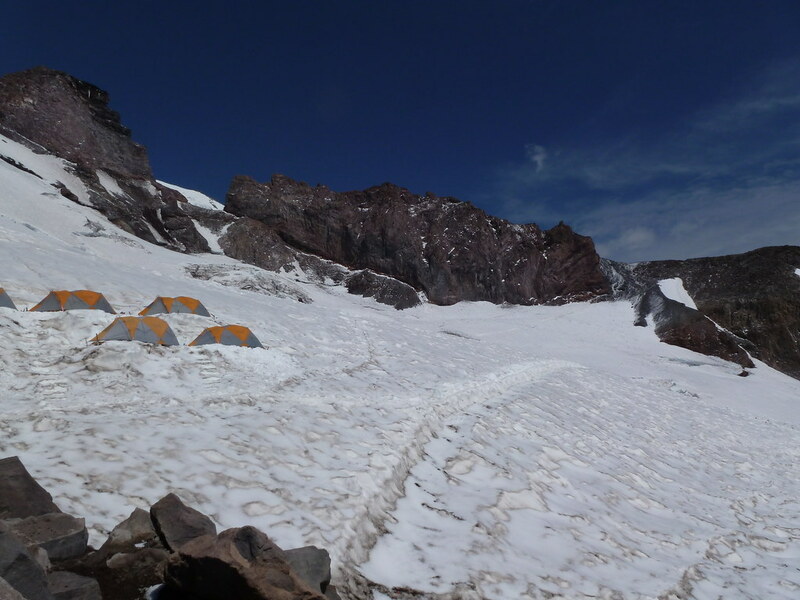 Camp Muir is sited on a rocky outcrop at the head of the Muir Snowfield. It has four huts – one for the National Park Service, a public one, one for the guides and one that is shared by RMI with one of the other guiding companies. There are also a number of toilets, i.e. small sheds with a toilet seat and composting facilities beneath (not pleasant!). Camping is also feasible. 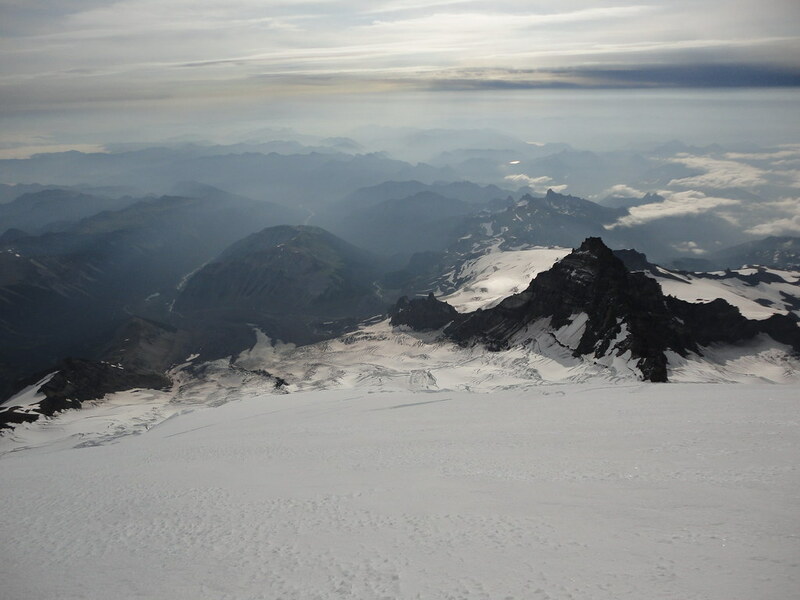 The rocky outcrop divides the Muir Snowfield from the first of the glaciers we would have to navigate on the upper part of the mountain – the Cowlitz Glacier. 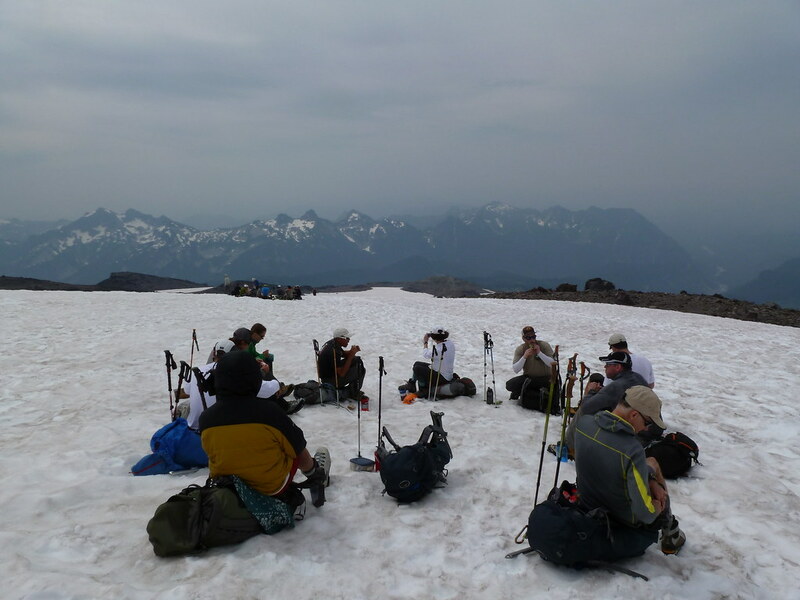 After our third stop, it was just 40 minutes to Camp Muir. 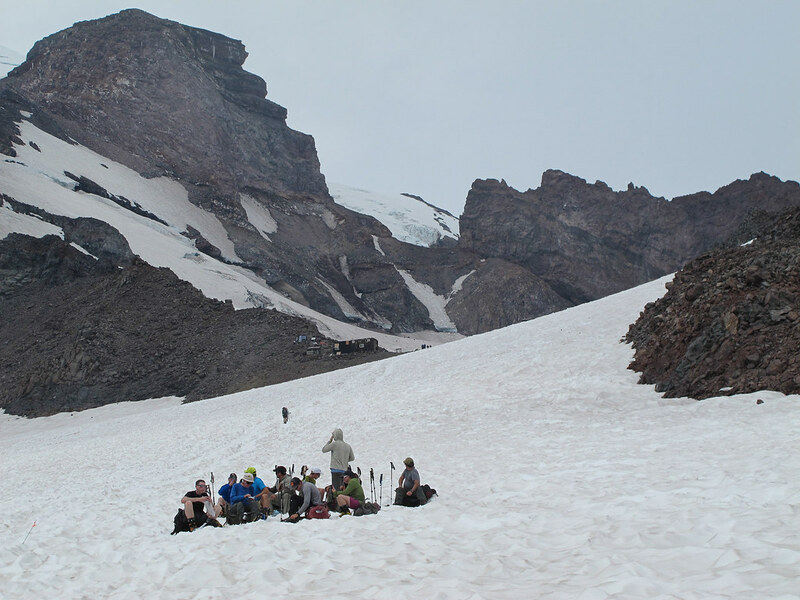 Here we are at our break which shows the setting of Camp Muir and a zoom of a couple of people just ahead of us. 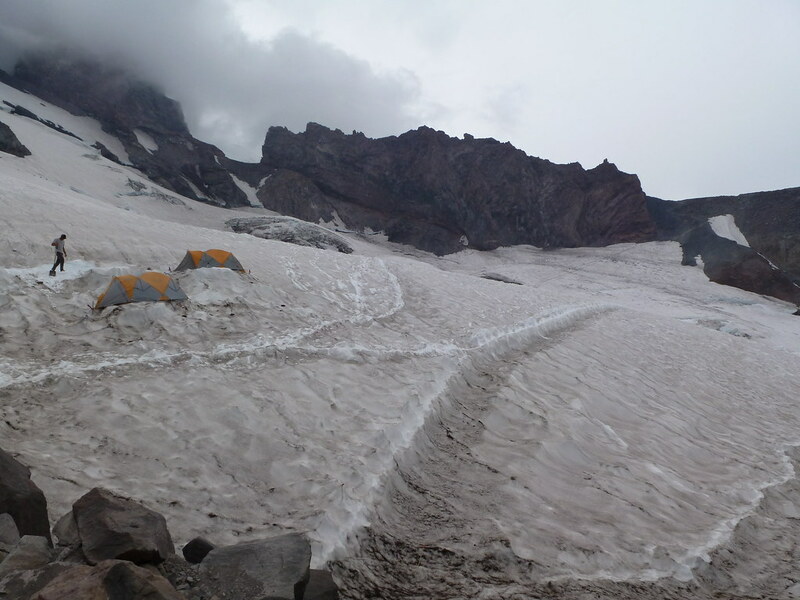 We arrived at Camp Muir before 4pm and set about organising ourselves. Walking poles, axes and rucksacks had to be left outside. Sleeping bags and anything else required for the hut had to be transferred into the hut. Sleeping mats were provided as were hot and cold water. 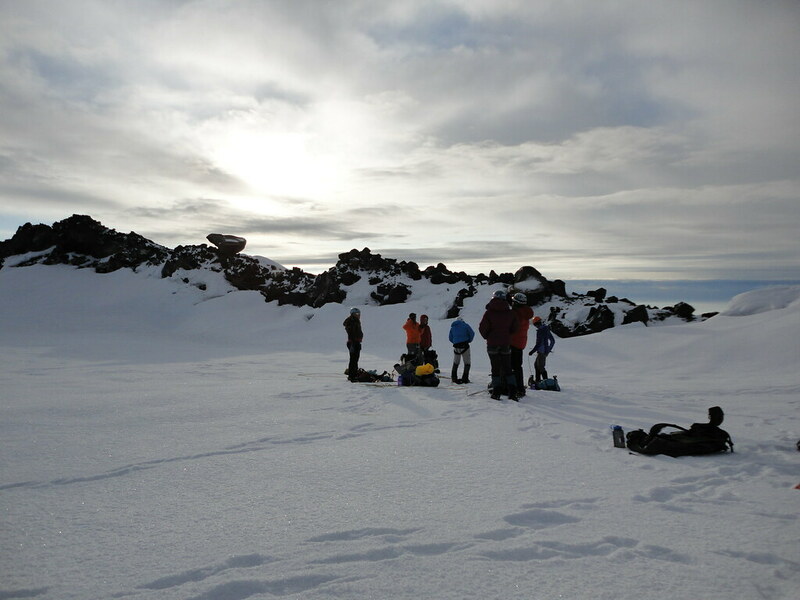 It was time to rehydrate with a target of drinking at least a litre of water, sort out sleeping arrangements, prepare the evening meal and repack the rucksack in readiness for the remainder of the climb – all before a final briefing by the two lead guides. Space in the hut was limited so it was a bit of a scrum. However, we all seemed to be ready at 5pm for our briefing. 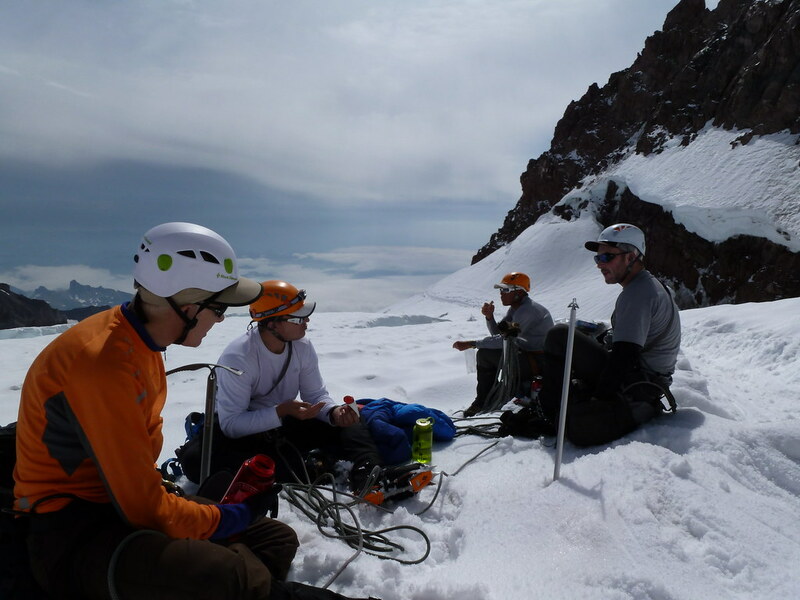 This dealt with updated route conditions, composition of the rope teams, where the stops were going to be (and the procedures at the stop – put on down jacket and then eat and drink! ), the guides’ absolute decision making powers on whether or not any individual would be allowed to continue at any particular point and toilet arrangements (don’t go!!!). We were asked “to be horizontal” by 6pm but we would not be told when we would be roused to start the next stage of the climb. Perhaps the most interesting event during the briefing was the electrical storm that drifted by for 40 minutes. It is the first time I had actually been in amongst lightning, rather than many hundreds of feet below it. Flashes were accompanied immediately by bangs. 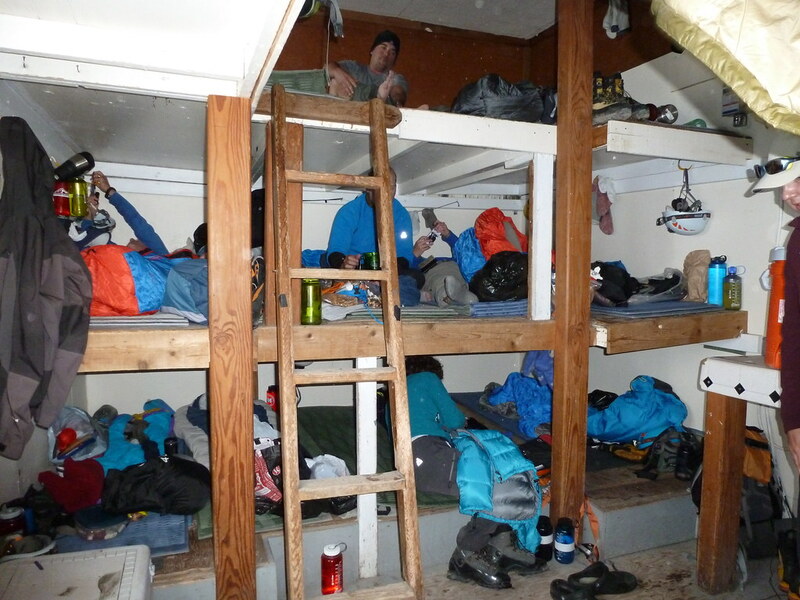 We could hear the precipitation hammering down on the roof and windows of the hut. It was quite exhilarating really. 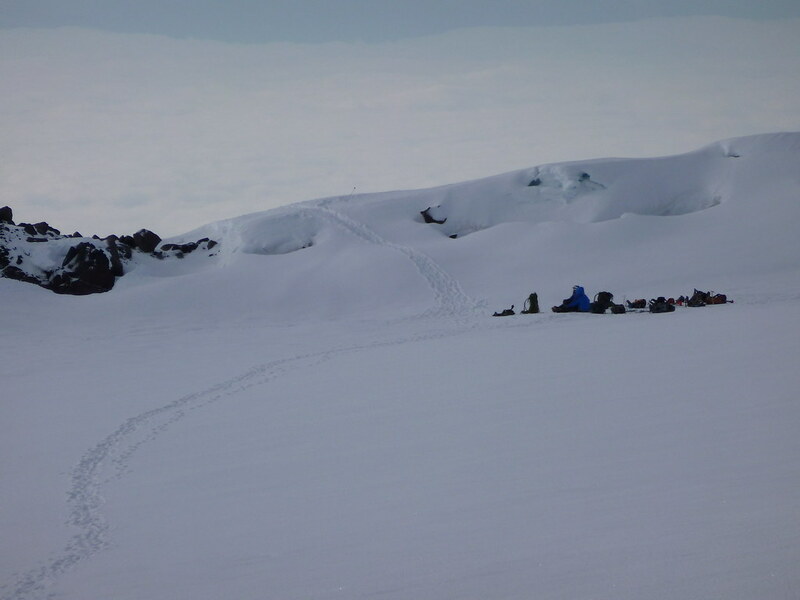 The guides conceded that we could be allowed to bring our rucksacks onto the hut so we all rushed out to rescue them – gladly taking the risk of being fried by a couple million volts. The storm passed by and ended at about the same time as the briefing did. I ventured outside again. But the storm had at least cleared the atmosphere. 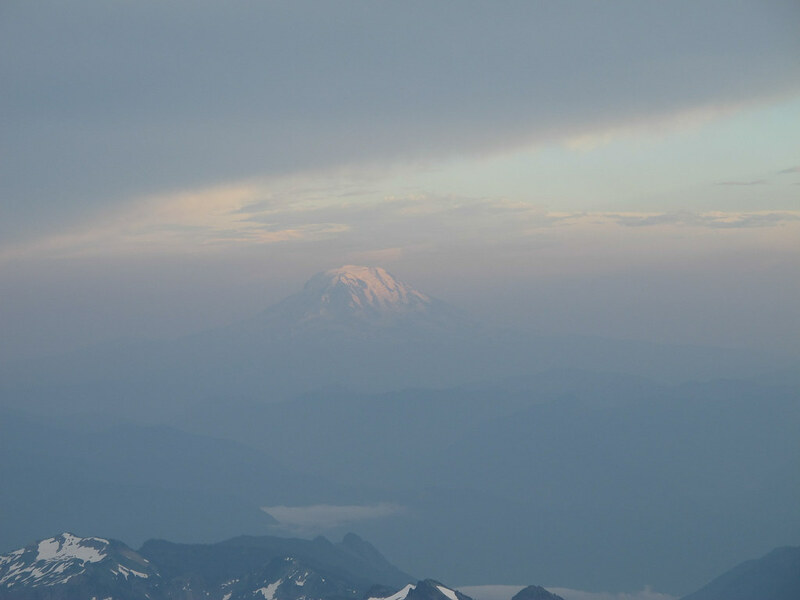 We were treated to views of Washington’s second highest peak, Mount Adams (12,281ft), which had been obscured from sight before. I used the word “roused” a few paragraphs above advisedly. I do not think I managed any sleep whilst in a horizontal position, but it is difficult to be certain. There were quite a few who were less prepared than I (or who had taken their rehydration duty more seriously) and this resulted in a steady stream of people getting up to relieve themselves. Whilst I had brought earplugs to use, I did not find them particularly effective. The guide company that used the other part of the hut also had a different strategy which involved a later start, so I could hear chatter through the thin wall that divided the hut. So 5 and a bit hours later when Brent came in from the guide hut at 11.30pm I was fairly groggy. We now had an hour to sort ourselves out before our summit attempt. Brent said it was a beautiful night – clear and still. So he wanted an early start in case the weather changed. 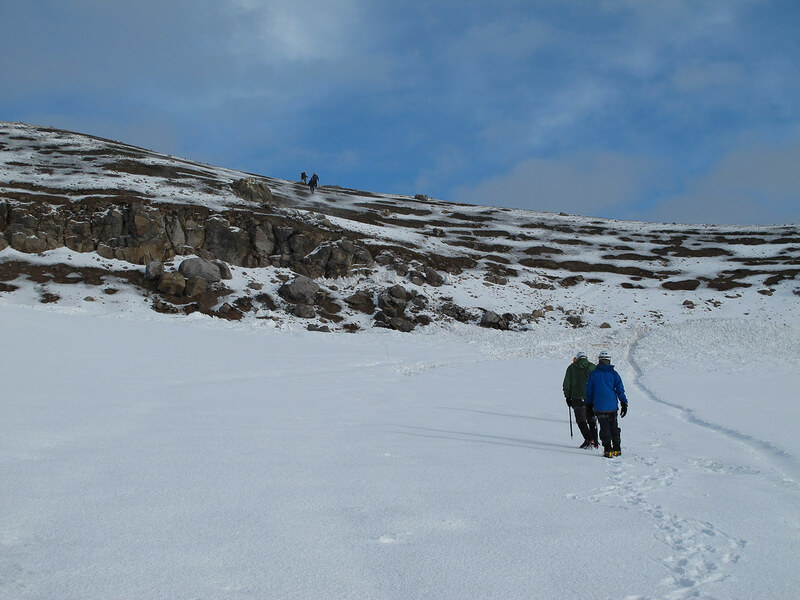 An early start also means the snow is firmer and you are out before the route gets too busy – and it can get very busy in July and August! Again there was the scrum whilst we forced food and drink down. 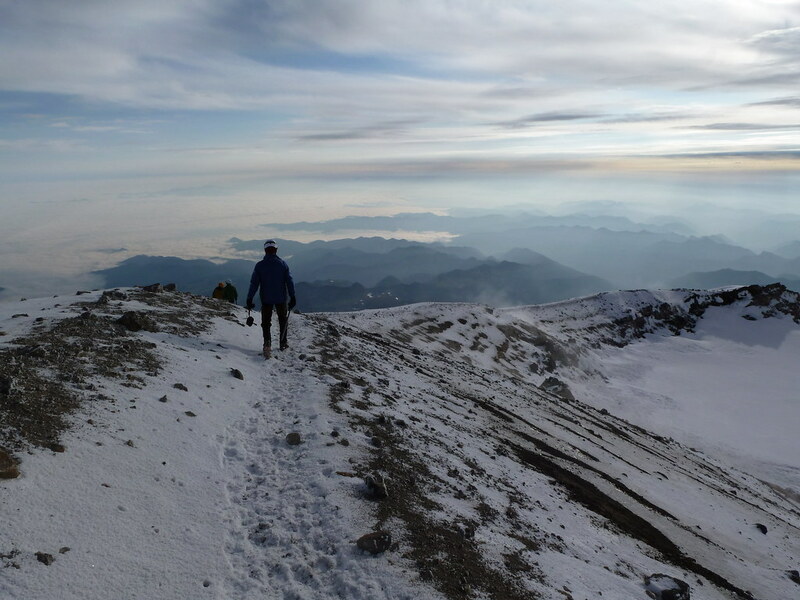 I had come with a container of oats and raisins that could be reconstituted with hot water and I also had an insulated mug that I filled with hot water which I would take with me on the climb. 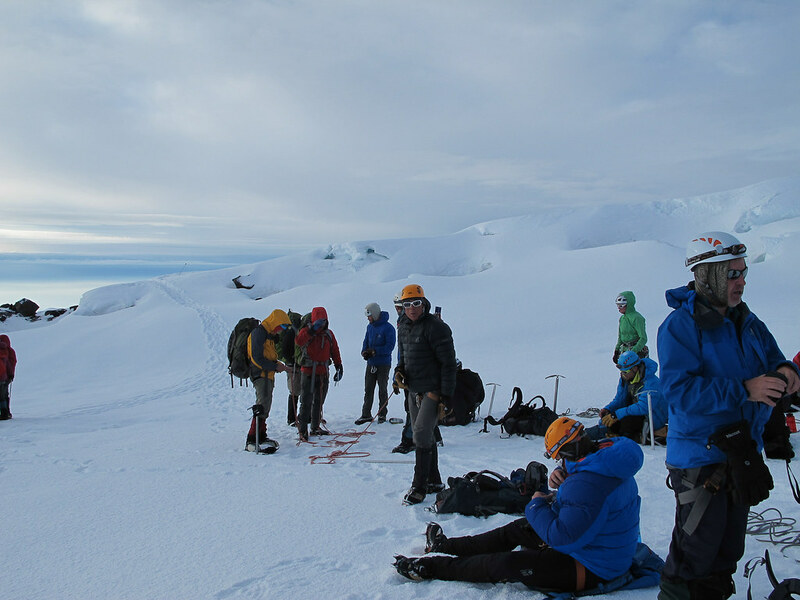 Harnesses, helmets and crampons were put on. Ice axes were made ready. Light from head torches bobbed around. The guides sorted the ropes and the rope teams huddled together with down jackets on whilst everyone readied themselves. I looked up and marvelled at the zillions of stars that twinkled above. 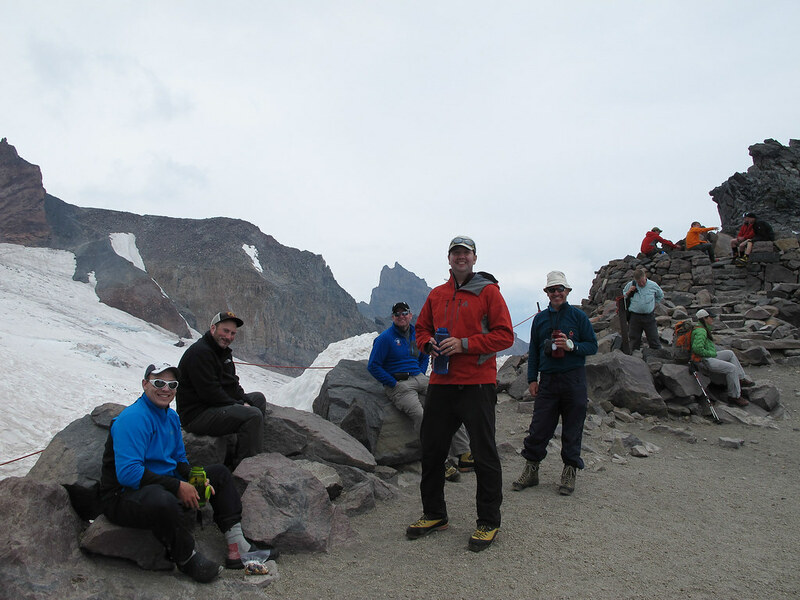 I was going to be on Steve’s rope together with Marshall (aged 62) and Bryan (who lived locally to Rainier). OK for the next section of the description of the climb there are no photos because of the dark. You will see photos of much of what I describe in reverse order so to speak on the way down. 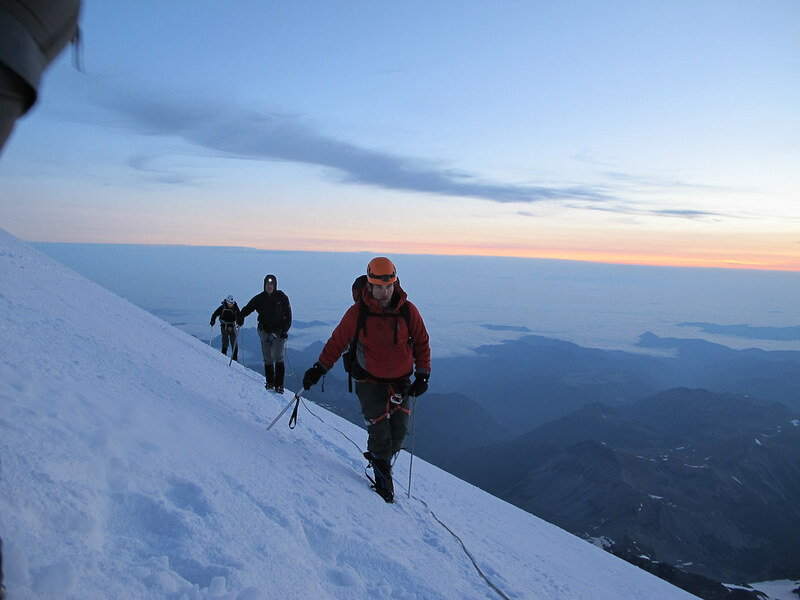 Instruction to go was given, jackets were stuffed hurriedly into sacks and we were off into the black of the night illuminated only by the small halos of light cast by each climber. We stepped out on to the glacier. Brent’s rope led the way; Steve’s was second. Climbing at night means that you only have an extremely limited feel for the environment that you are passing through. It is also difficult to get a feel for how far you have gone and what is to come. This can be disconcerting for some. After a short while you settle into the pace and rhythm set by the guides. 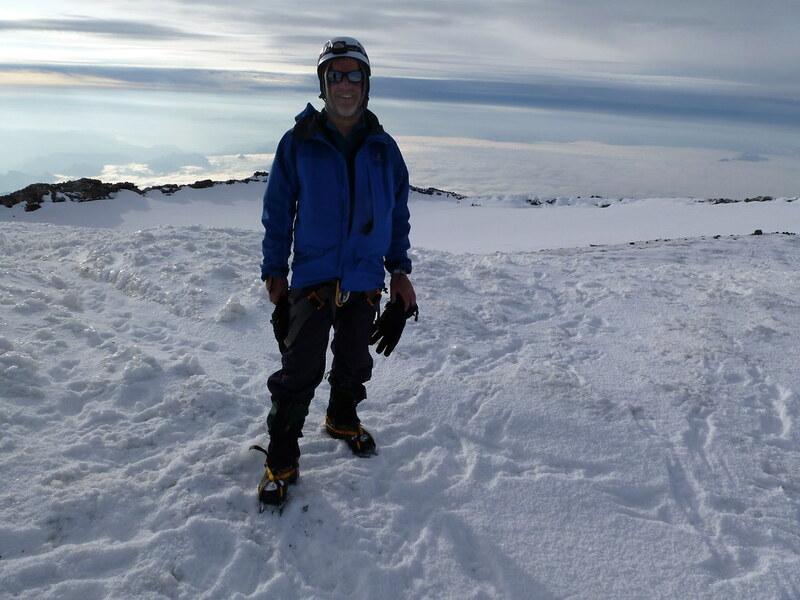 Brent has done this many times before – in fact so many times that he has climbed Mount Rainier the second most times of anyone (over 460!!). So I knew that we would have a stop after about an hour. 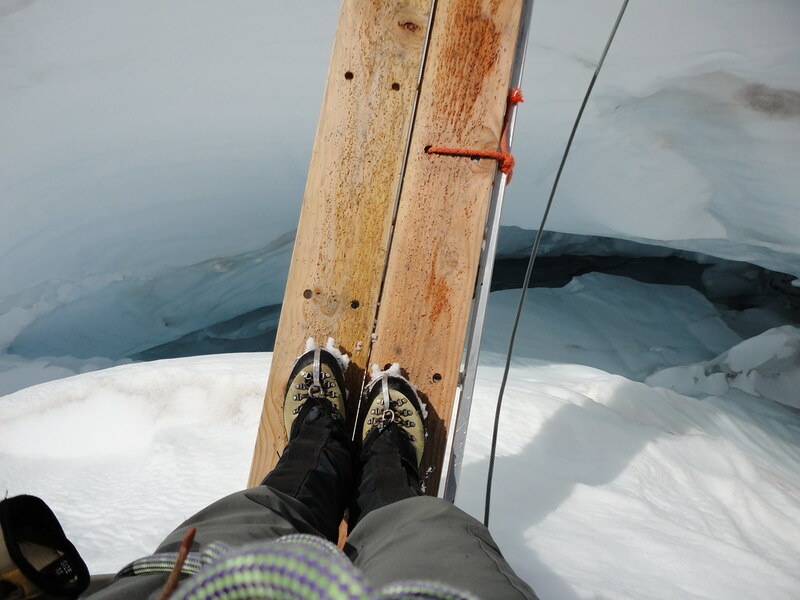 I concentrated on keeping the right pace, breathing well, ensuring that the rope did not become too slack and stepping over the odd small crevasse! 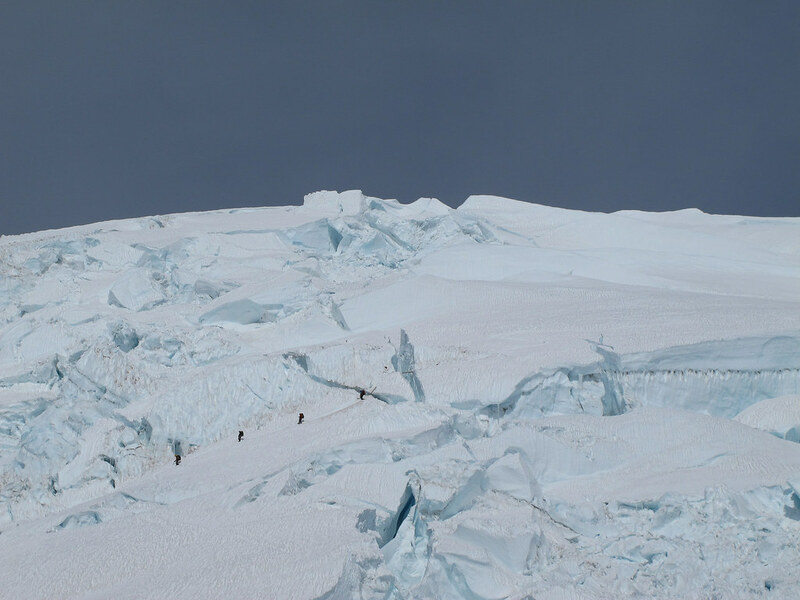 Looping around the top of the glacier the incline was not too great but on the far side we had a rock band to scale. 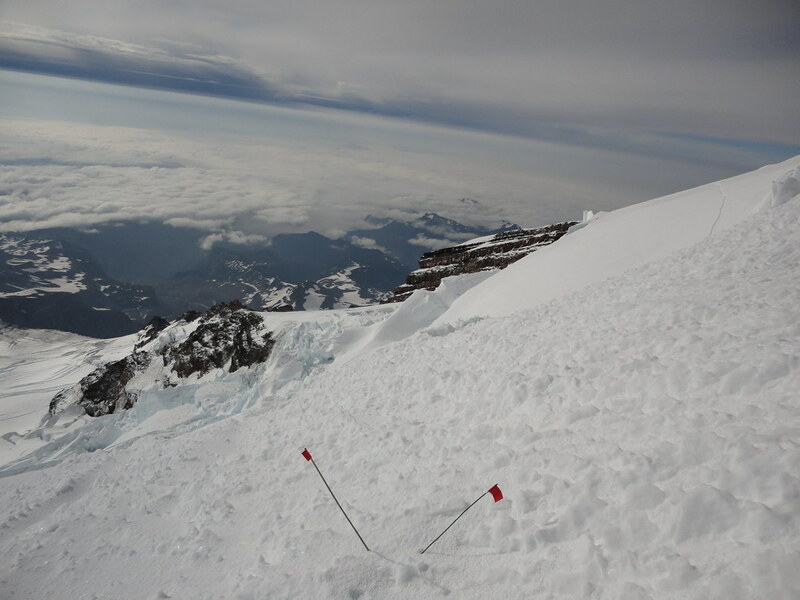 This we had to do in crampons. The combination of the predominance of volcanic ash and, particularly, the recently fallen graupel meant that this section was not too bad. 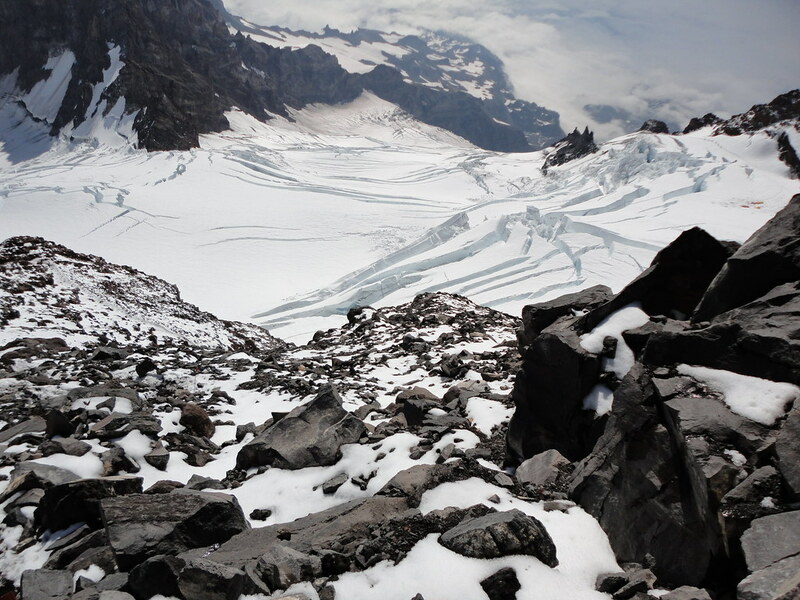 We slowly zig zagged up and over before dropping 50 feet or so down on to the next glacier, the Ingraham Glacier. We carried on a further 15 minutes or so and it was time for the first stop. So on with down jackets and eat/drink as instructed. We had gained around 900 feet of the 4,300ft we needed to scale. 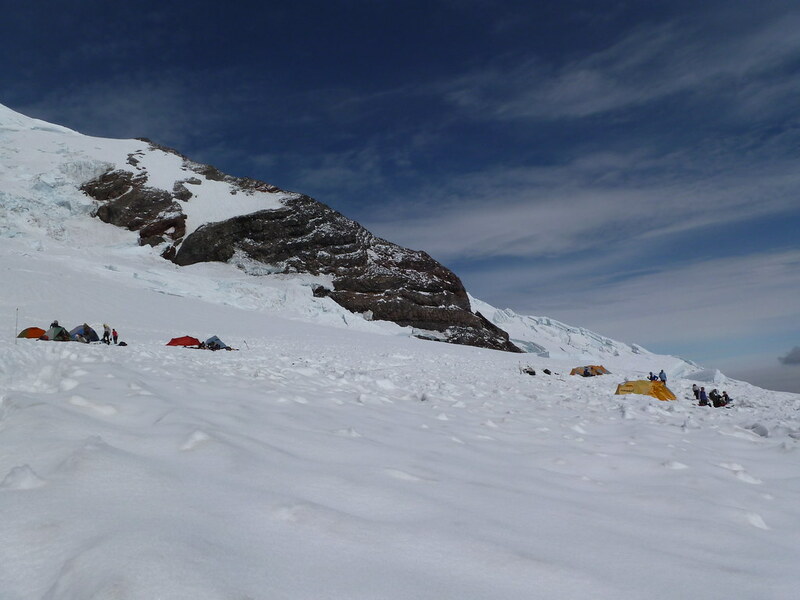 A little below us, there were orange glows from tents pitched on this glacier. The third principal guide company that does not have use of the Muir Camp huts brings its clients here. They had already started up. Lights could be seen bobbing up above. It was at this point that one of our number decided that she had had enough and decided to turn around. This meant that Katrina also had to leave us in order to help her down. So, Mike who had been with Katrina was added to our rope team. The next section was the longest section between stops. 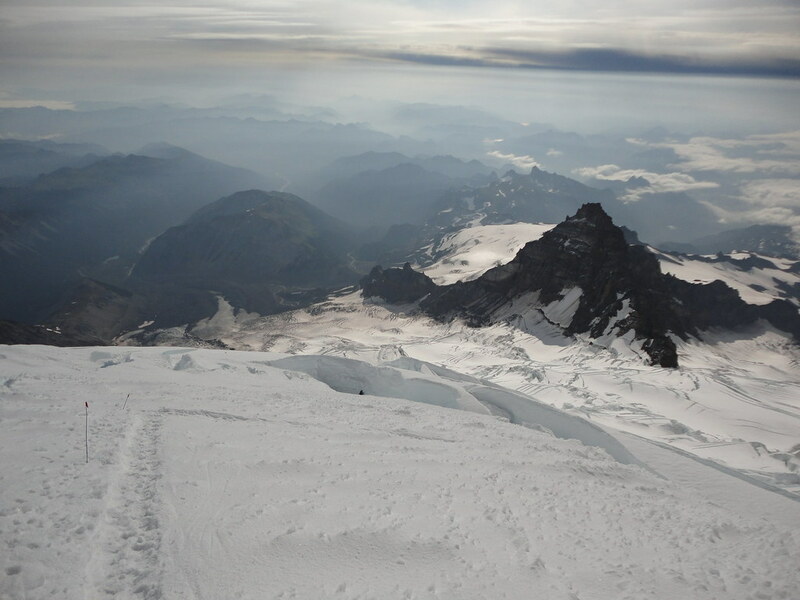 It involved crossing the second glacier and then ascending a rock ridge called a cleaver. 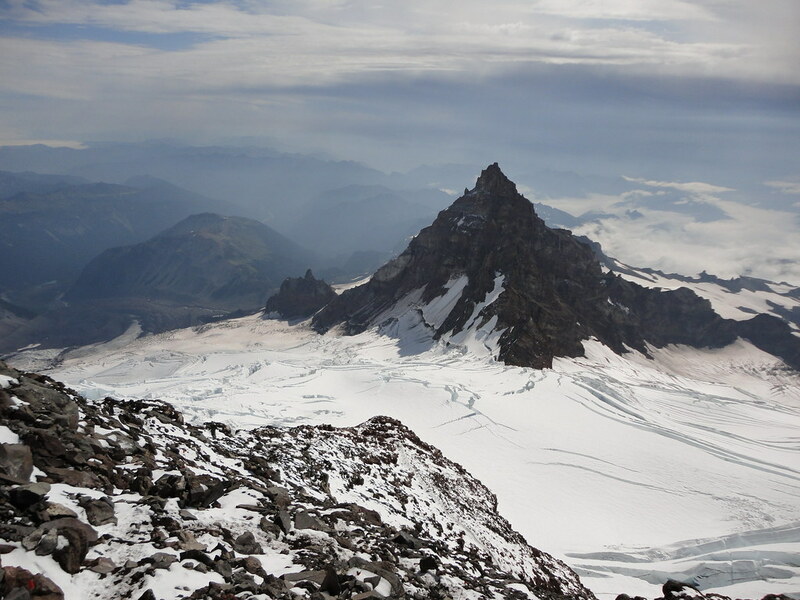 A cleaver divides two glaciers, in this case the Ingraham Glacier from the Emmons Glacier. And this cleaver is called Disappointment Cleaver, after which the route we were climbing is called. I was hoping that this name would not be a harbinger of doom for my attempt. I was still feeling OK and my calf muscle had certainly calmed down. I was feeling a lot happier in myself as a result. The fifteen minutes allotted for the stop was over all too soon and we were off. 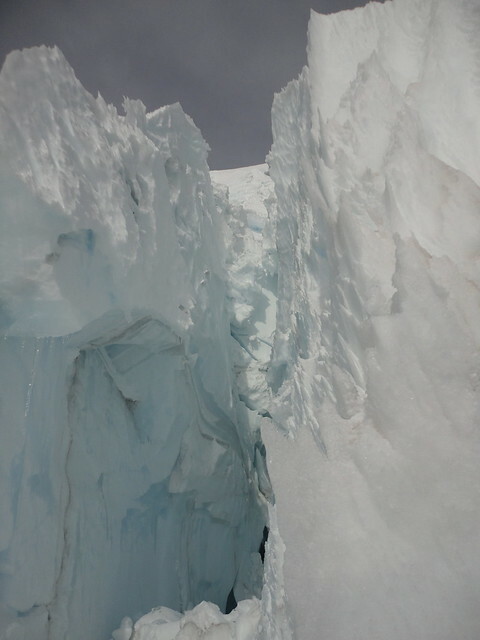 We climbed up the side of the glacier to (as I was to find out later) avoid a series of crevasses but even so we had to cross a wider crevasse on a ladder that had been fixed across it. The circuitous route also took us beneath some cliffs where there was the potential for ice or rock fall. Having safely achieved this section we were now at the foot of the cleaver. Here we were short roped and started the laborious climb. Whilst the graupel helped, this section was a lot rockier and foot placement had to be careful. It was very easy to turn the ankle or to trip on some hidden rock. So this section was quite slow and took an hour and twenty minutes. Eventually we reached the top of the cleaver and a short while later a small level section where we could have our second stop. So on with the down jacket and down with the food and drink. It was now just after 3am and still pitch black. We now at around 12,600ft. Much to my surprise two guys in our group decided they had had enough at this point. So we would now be down to five but, more to the point, we would lose another guide – Steve. Brent could take no more than four people on his rope. Fortunately we had the other RMI group with us (who would also lose a client here). So I went on to Brent’s rope with Bryan and Mike; Marshall joined the other group. 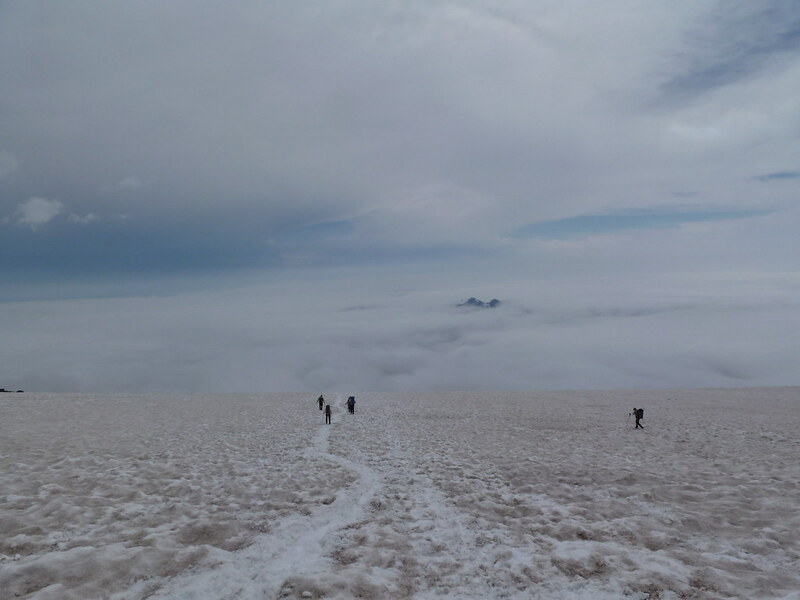 The guides emphasised that commitment was now needed from those who remained because we were reaching the stage that, if other clients wanted to stop before the summit, there was a risk that there would be insufficient guides to take the remainder further up. All gave that commitment. It was now the coldest part of the night. I put on my cag and a buff as a cold breeze had sprung up. With the rejigging of ropes resulting from the loss of three clients, we had a twenty minute stop. The next section would be about an hour but would involve something I had not experienced before. And it would be done in the dark! We set off directly upwards this time. As the slope increased its angle we zig zagged ever upwards at the same consistent pace. 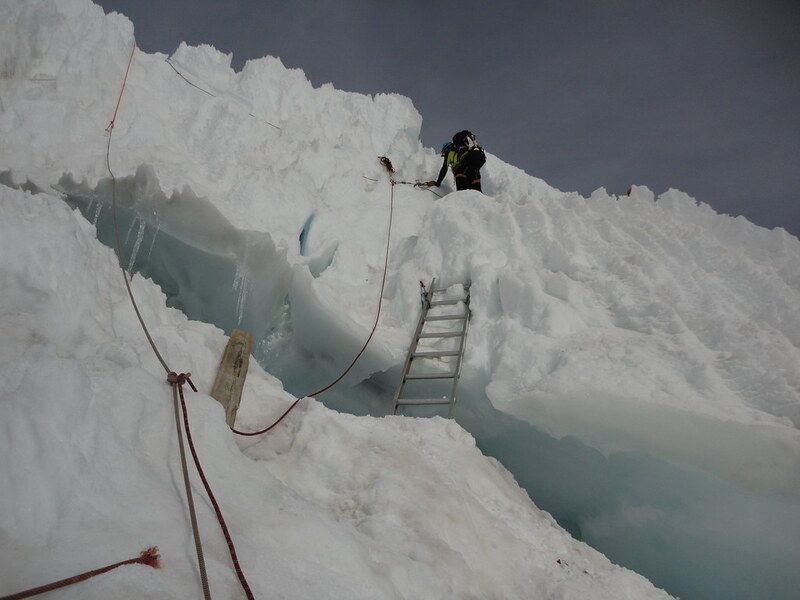 After another 20 minutes we came to the challenge – a ladder and fixed rope system over two crevasses. The first ladder was set at around 35o with a fixed rope dangling to the left. As all of this was tucked away around a corner I could not see Brent and Bryan ahead of me make the 20ft ascent. I discerned their progress from the tugs on the rope ahead of me. It was soon my turn. I wrapped my left arm around the rope and stepped on to the lowest rung of the ladder. Holding my axe just under the head I stabbed the pick into the snow just to the right of the ladder before running my left arm up the rope and gripping it. I took a couple of steps up the ladder before stabbing again with the axe. 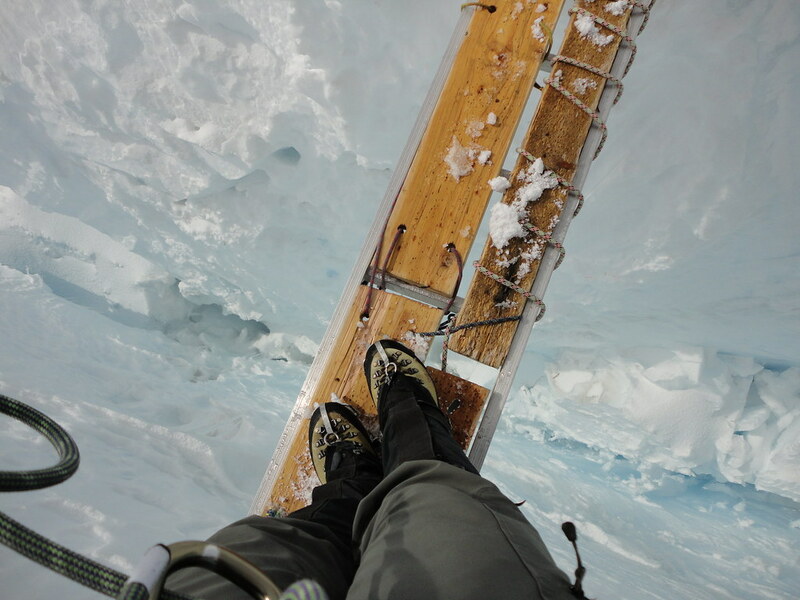 Rather than use the whole length of the ladder it was easier to step off to the left on to the snow above the crevasse and to kick steps upwards. So I did this, repeating the left arm movement up the rope and the stabs with the axe. I was soon up. The trail then moved immediately to the right and was barely the width of two feet. Here is was necessary to clip into a running belay that had been fixed in the slope to the left. A few steps later the second ladder, in the horizontal plane, fell within the light of my head torch with a yawning black void beneath it. I reached down for a rope that acted as a hand rail. I was not going to risk the consequences of a trip here. Any difficulties were soon over and the team safely over we carried on up. 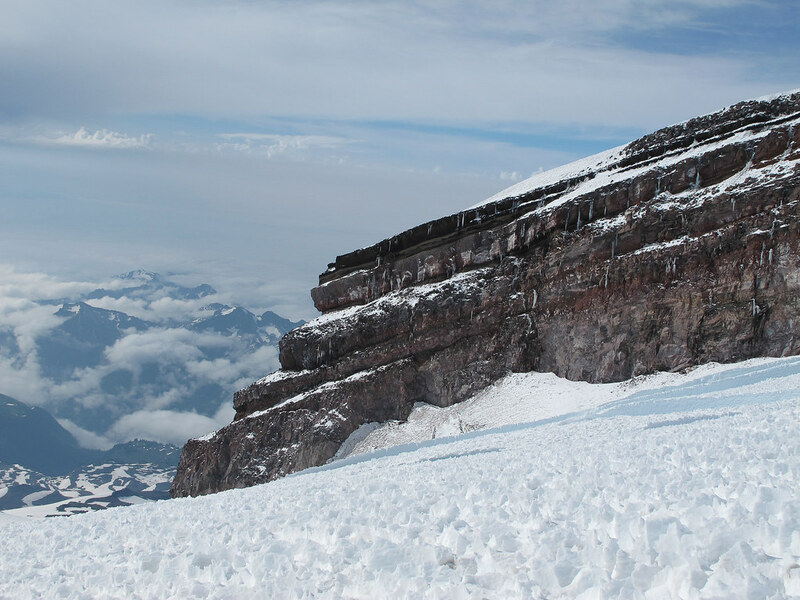 The Emmons Glacier is the largest by size on the mountain. In order to avoid crevasses higher up we had to take a long diversion to the north east (we were climbing the eastern side of the mountain) before gradually making our way back again. As one point we had to lose about 150ft of height and I noted that this would be an unwelcome section for the descent. We settled down into the same rhythm again which had been disturbed by the last ladder section. But now the atmosphere was changing. The first light of dawn was visible. The valley depths were still inky black, but up here at over 13,000ft features could now be made out. I was able to turn off my head torch. As there was little if any wind, the graupel lay 2 inches deep up here as well. To get satisfactory purchase on it, it was necessary to kick into it with every step. 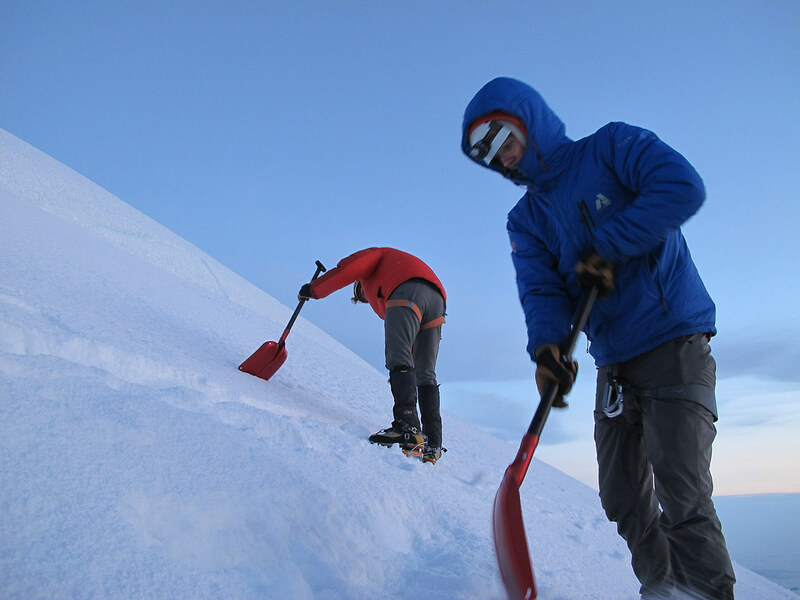 By doing so the crampons would bite into the firmer snow beneath. Failure to do this led to the risk that the foot would slip or the ankle would turn uncomfortably. 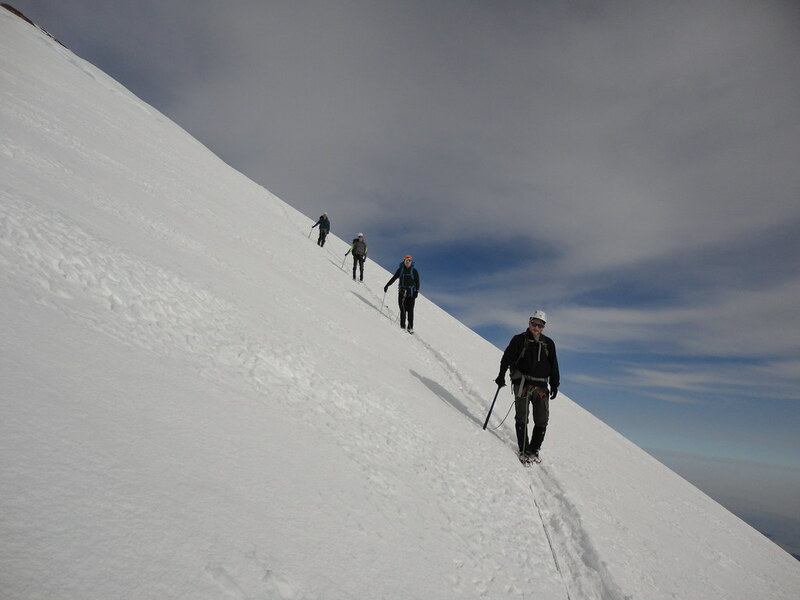 Relief was at hand for a short section where we crossed some nice firm neve. But that was short lived. It was difficult to keep concentration on stepping, breathing and the rope work. I was for ever tempted to look around at the growing views. But now it was time for our third stop and this would provide the opportunity. The terrain was a little steep and the guides shovelled out some spots to sit. Having removed our jackets, food and water from our packs we would always sit on the packs to provide good insulation from the ground. 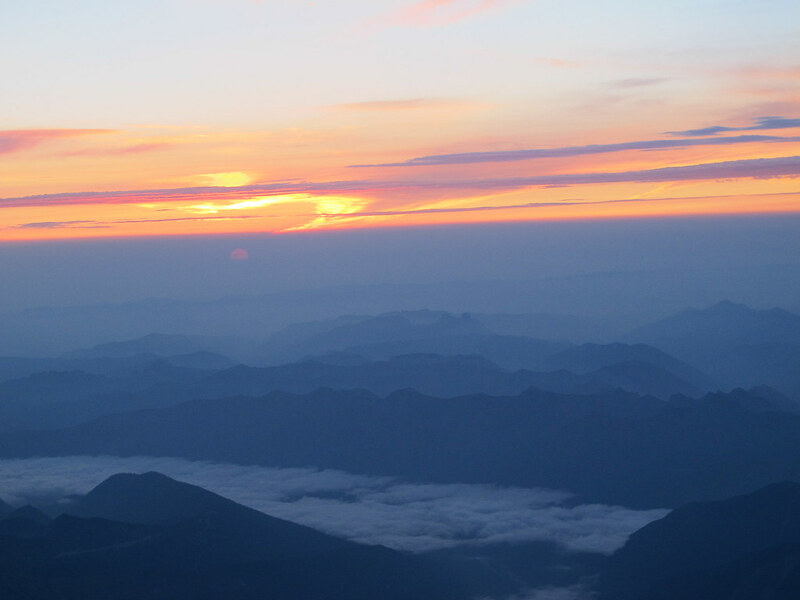 The sun was now just rising above the horizon, showing red through the haze. There was a lot of haze around because many States have been affected by wild fires this year. For me the summit was now within my grasp. At 13,500ft we were now about 900ft below it. I was looking forward to the double happiness he describes. I took great gulps of water as I was becoming dehydrated in the cool dry air. I forced a small amount of food into me, but I was not feeling like eating anything. I knew I should eat in order to keep energy levels up, but I was feeling good so let myself off. 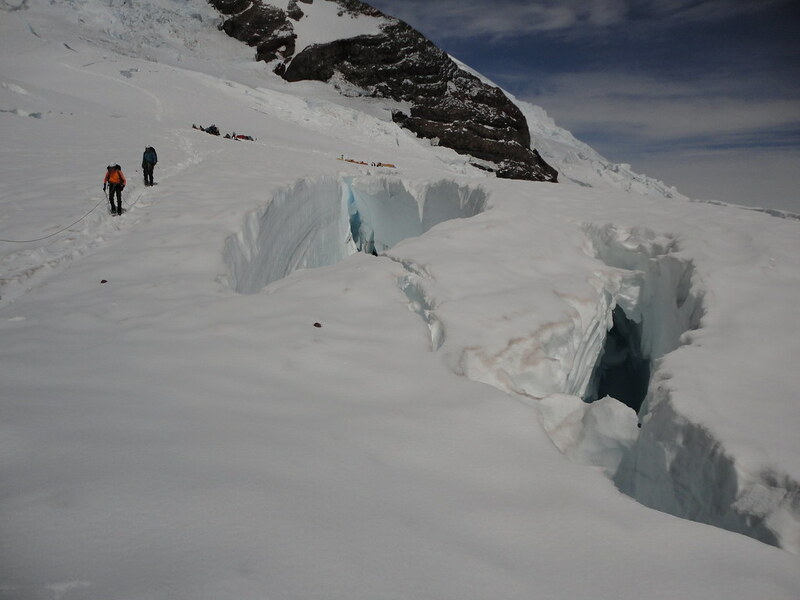 After our allotted 15 minutes we were off again, almost immediately stepping over another small crevasse. The slopes up here are largely featureless. So it was back into the routine of watching steps, breathing and rope –the pace was comfortable. 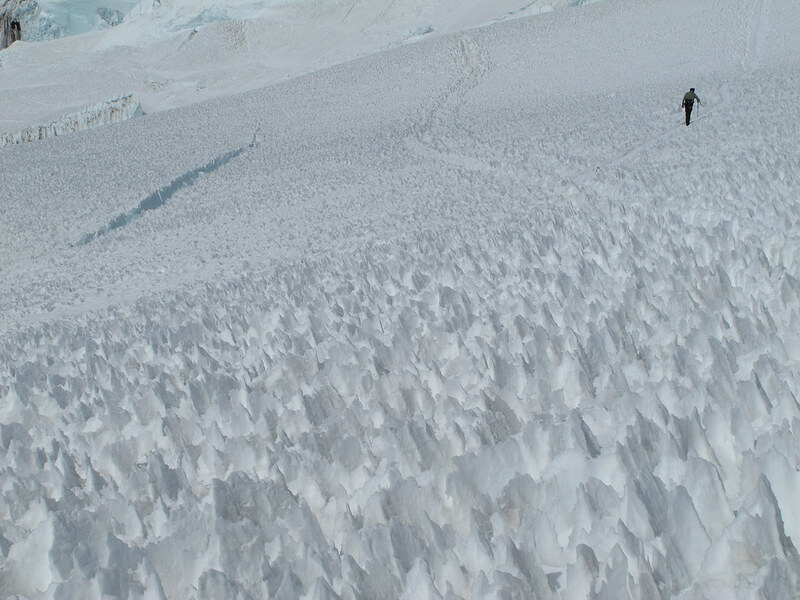 The trail from Camp Muir to the summit is marked by wands. RMI have responsibility for keeping the trail marked and Brent regularly stopped to re-align wands (particularly on the descent). 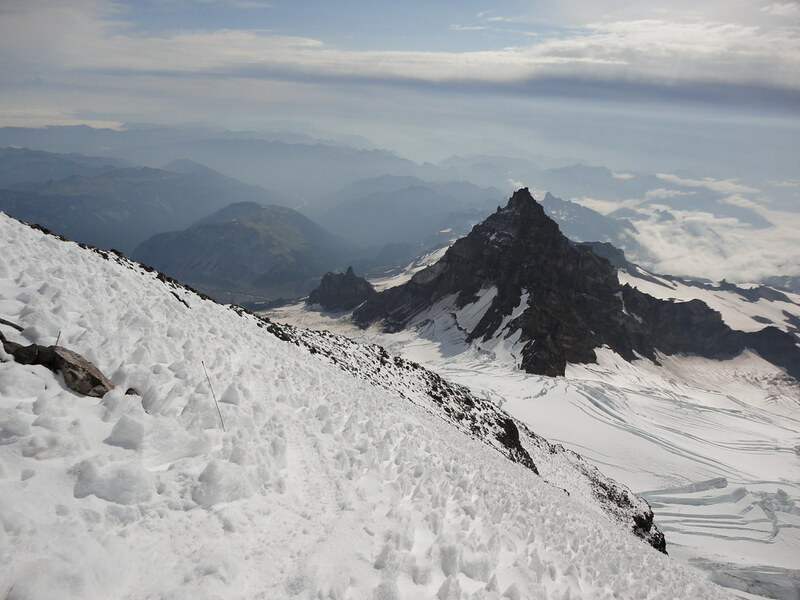 The route of the trail changes daily as the glaciers creep downwards and crevasses open up or move. This section was just about starting to feel interminable when suddenly there was no more “up”! We stepped over the crater rim and dropped 20ft into the crater itself. We had done it! Yay!! Well sort of. 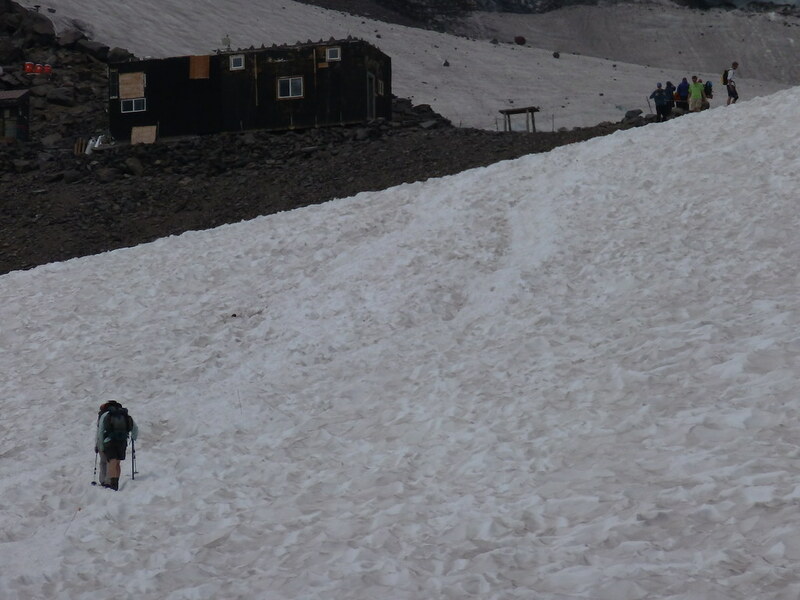 It was 6.40am, 6 hours after setting off from Camp Muir. Here we were able to unclip from the rope and dump our rucksacks. Again we were encouraged to eat and drink. I took out my insulated mug and downed the ½ litre in one glorious go. I stuffed some dried fruit into me. 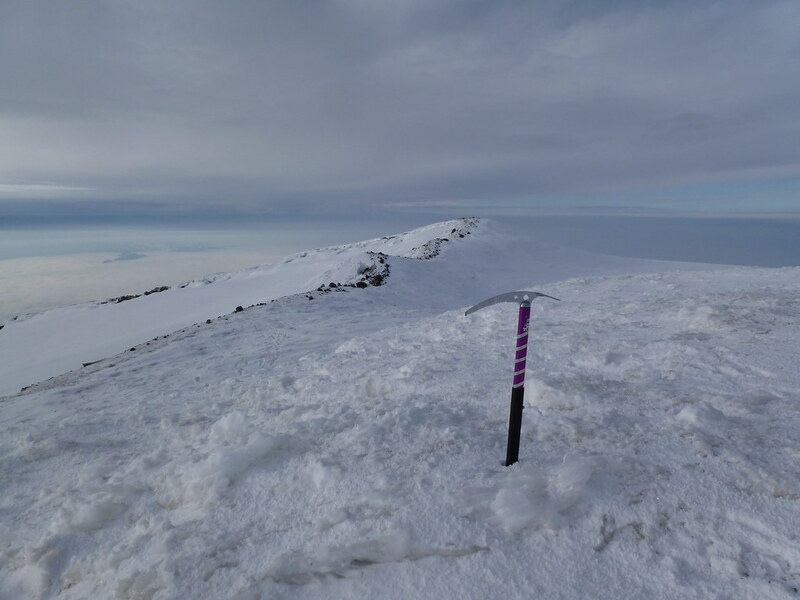 In actual fact the true summit was still ¼ mile away and 200ft above us on the opposite side of the crater. The crater is like a saucer which has been tipped. We had entered at the lowest point. RMI will give you their summit certificate by reaching the crater where I now was. All the guide companies reserve the right not to go to the true summit if weather is inclement or they think an individual is not up to it. 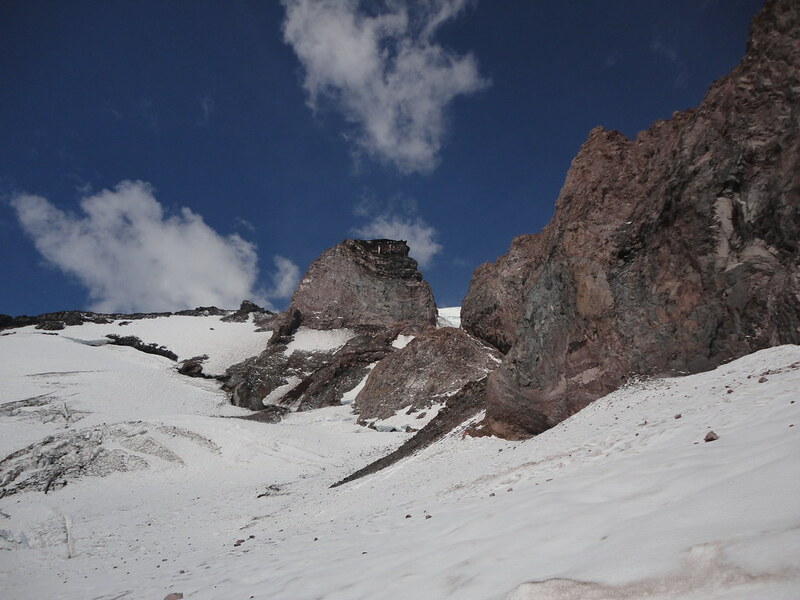 But today the weather was good and all but one client felt up to trekking across to Columbia Crest at 14,441ft as the true summit is known. So off we went! You will note the rocks ahead. Why aren’t they covered with snow? [answer below]. Here is the happy band (L-R Marshall, me, Brent, Bryan and Mike with Ryan taking the photo). 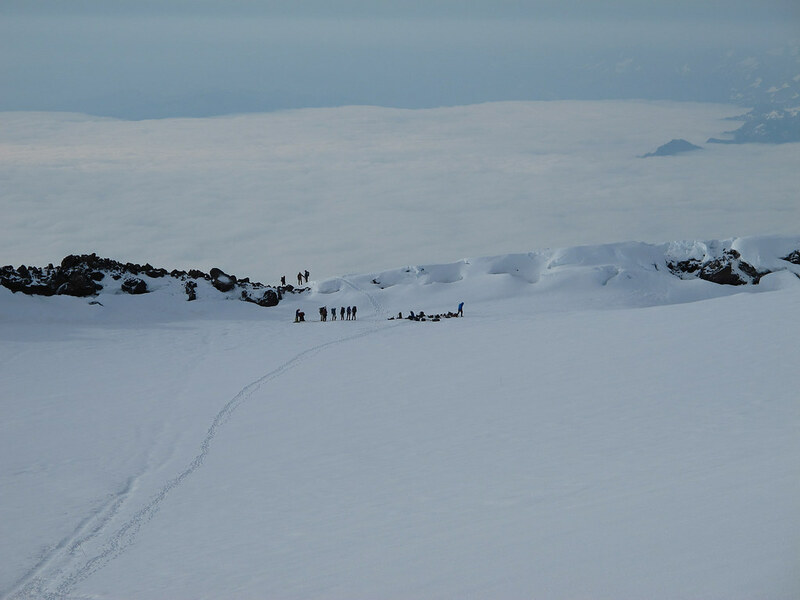 A view across the crater with a sea of cloud below. 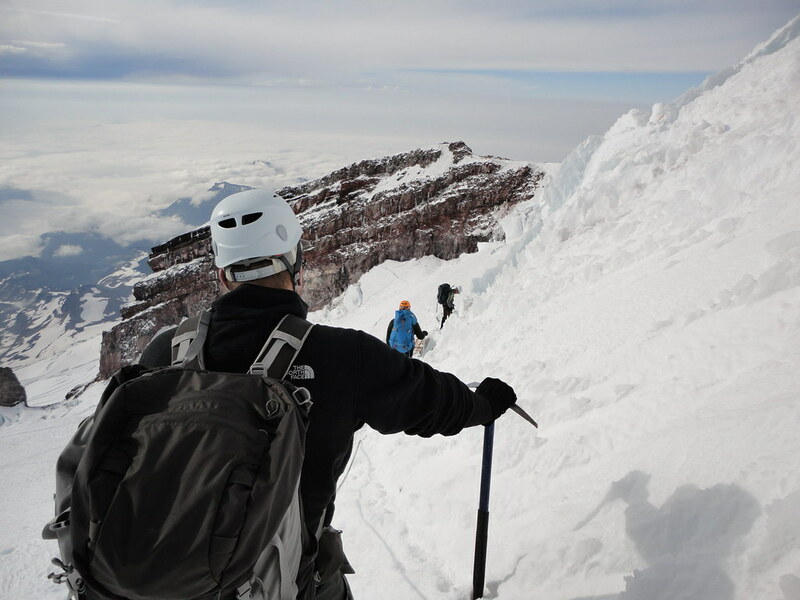 Liberty Cap, a subsidiary summit of Rainier. Note the plumes of steam. There is the answer to why there is bare rock up here. The rock is warm! Back to the kit and the footprints over the crater rim. Around the inside of the crater we could see depressions in the snow. These are caused by melting snow from the thermal activity beneath. 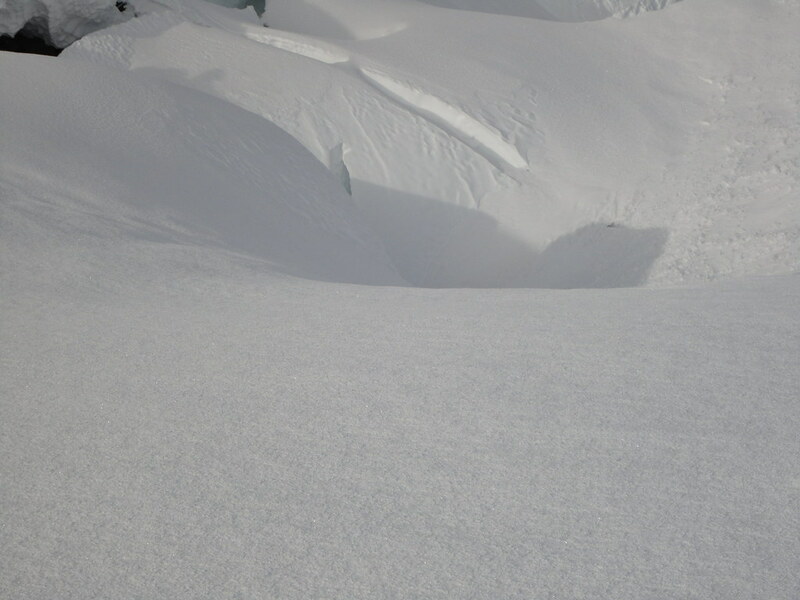 It is possible to go down these and into ice caves beneath the snow of the crater. 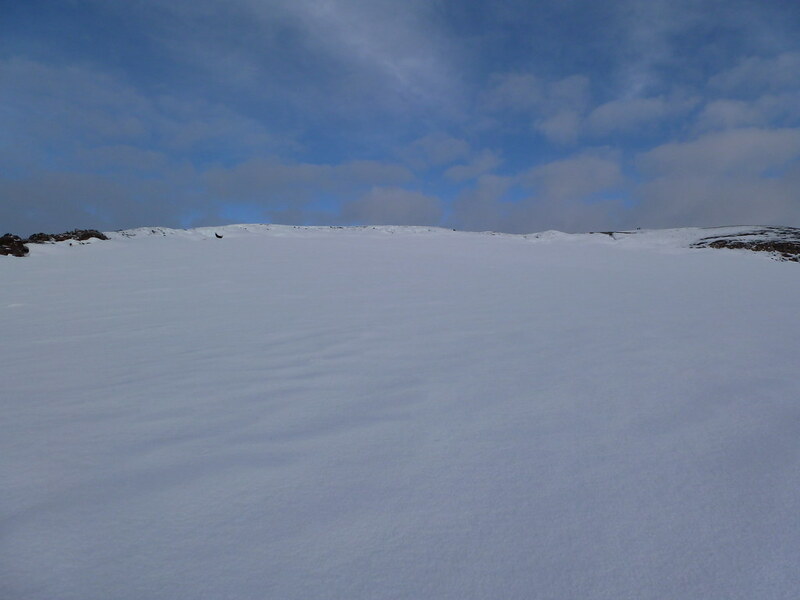 There is even a lake under the crater snow. Unfortunately we did not have the opportunity to explore this. 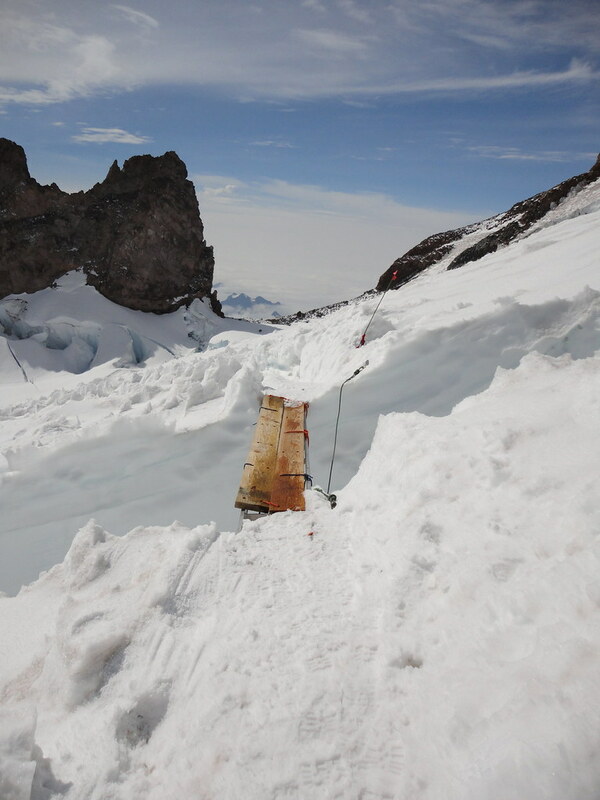 This cave system can also provide protection for climbers caught in a storm on the summit. 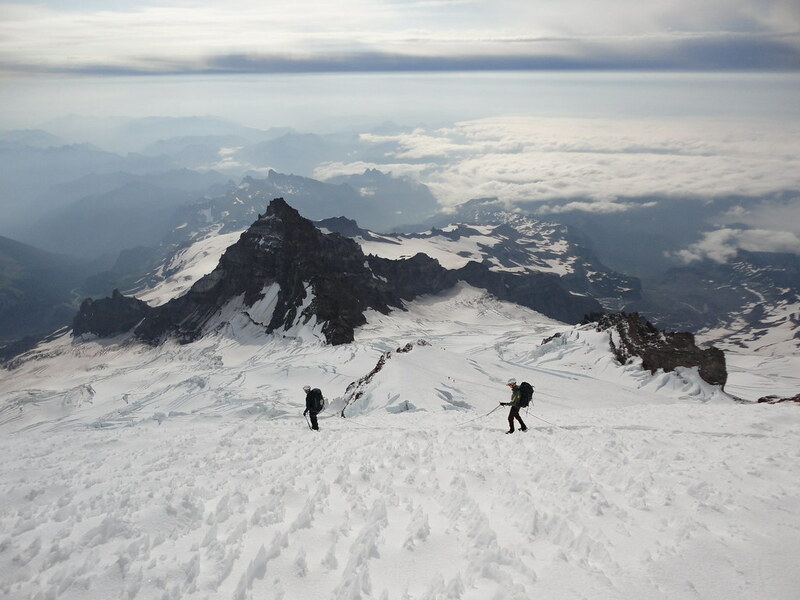 Descending the rim of Columbia Crest I was overcome with emotion and started blubbing like a big girl’s blouse. What was going on!!?? This is not the sort of thing that a hardened mountaineering Yorkshireman does. OMG (as my daughter would say). Fortunately I was not near anyone so I was not going to embarrass myself (like I am now doing by confessing such behaviour on a forum most of whose participants I do not know – oops!) I guess the sort of errant behaviour I displayed was caused as a result of relief (months of training and of anticipation and the niggling calf) and achievement (someone not in exactly the prime of his youth can still do this sort of thing). Or perhaps I was experiencing John Muir’s “double happiness”. Anyway, by the time I returned to the kit and to the others, the stiff upper lip had been duly restored and my sun glasses covered up any other possible evidence. Sorry! Our time at the summit was over. A bit of food and further fluid was hurriedly consumed. We roped up again, this time with me at the back of our rope team (other than through the ladder section where I led). In the meantime I took off two layers on my top and switched to lightweight gloves. I wished I could have taken off my thermal bottoms. It was going to be hot! We were on our way down by 7.50am. OK enough of the words now. Here are pictures of the descent largely taken by Brent on Ryan’s camera. We were not allowed to use ours! 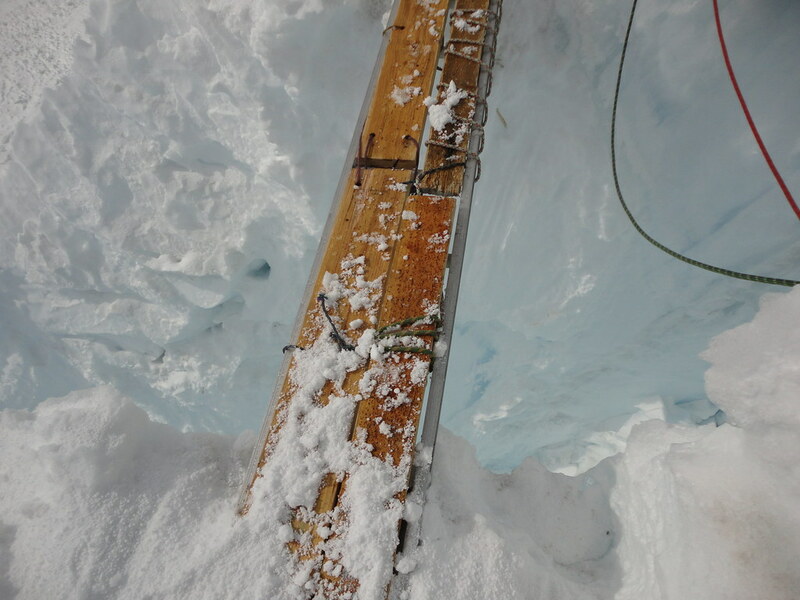 The two ladders across the crevasses can be seen in this picture with the lead climber just approaching the 35o ladder. We saw ice and rock fall from this cliff as a result of the warming effect of the sun. Top of Disappointment Cleaver. Little Tahoma peak in the near background. The same cliff again now showing Cathedral Gap, the route between the Ingraham and Cowlitz Glaciers. Now on the Ingraham Glacier. Camping on the Ingraham Glacier with Disappointment Cleaver behind. 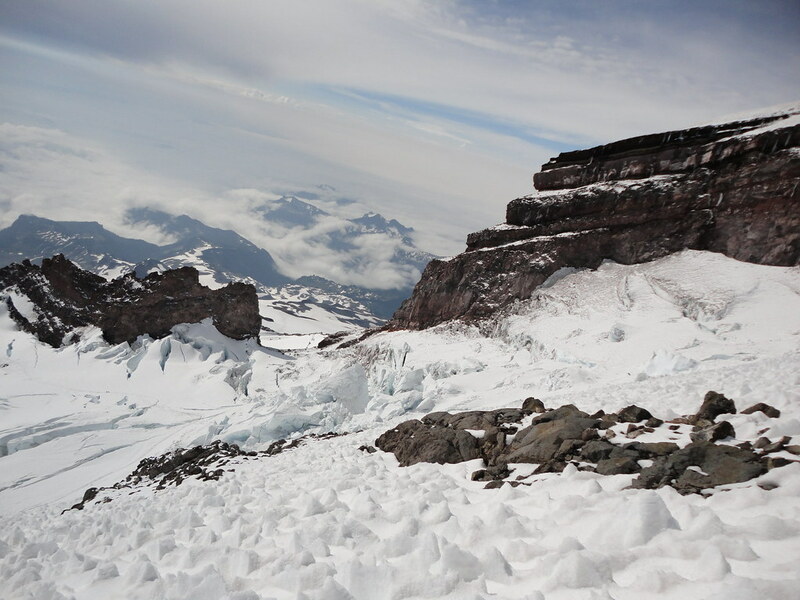 Top end of the Cowlitz Glacier – note the blocks of ice. Across the Cowlitz Glacier. 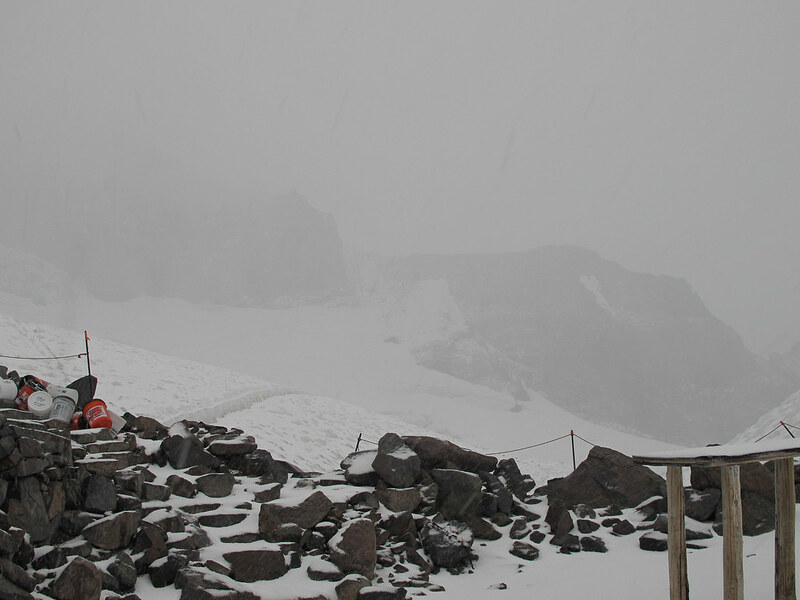 Camp Muir is in the dip just right of centre. 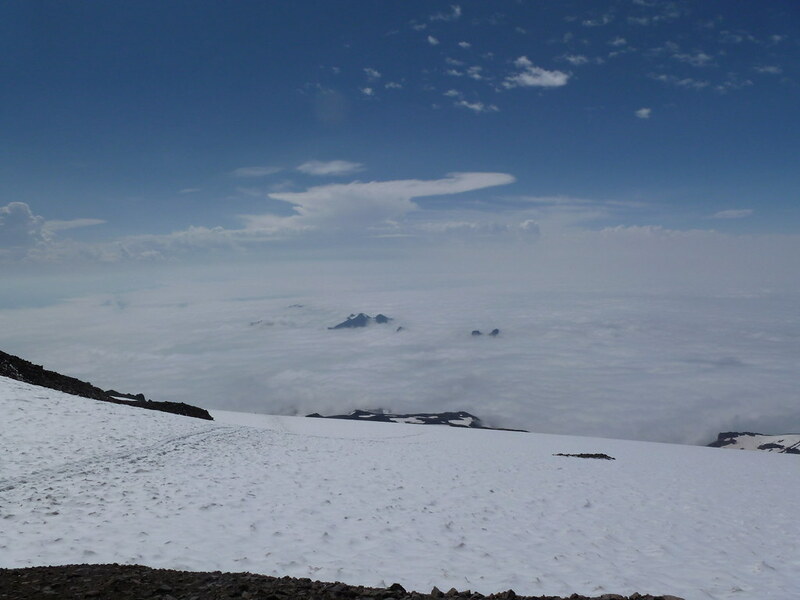 View down the Muir Snowfield from Camp Muir. We were back here by 11.30. So a round trip of just under 11 hours. We then had to clear the hut for the next RMI groups and repack our rucksacks as we were going to descend the remaining 4.700ft. So today it would be a climb of 4,300ft and a descent of 9,000ft. 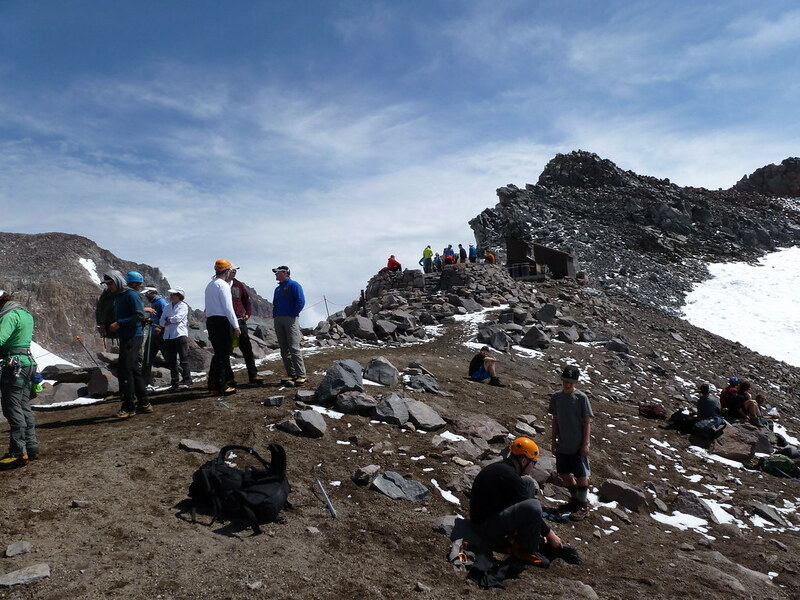 Milling around at Camp Muir. 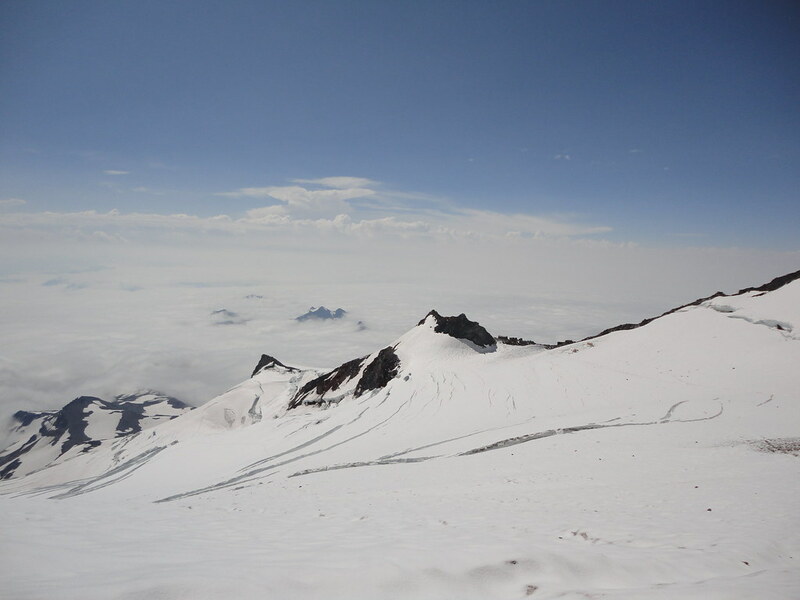 A view back across the Cowlitz Glacier. 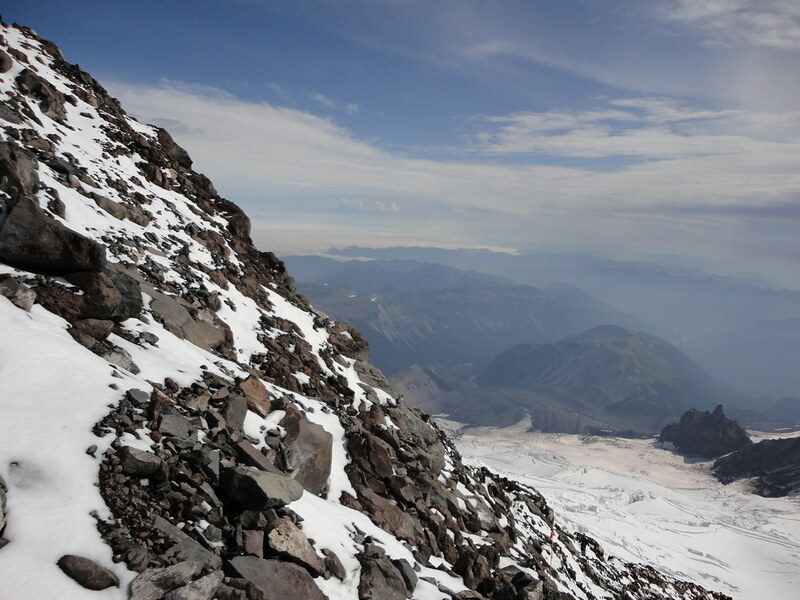 Upper part of the descent below Camp Muir. The snow was sun cupped (http://en.wikipedia.org/wiki/Suncup_(snow)) and starting to get a bit mushy, but this did mean we were able to indulge in a few bum slides where the slopes were steeper. J Wet bums soon dried out in the warmth of the lower mountain. 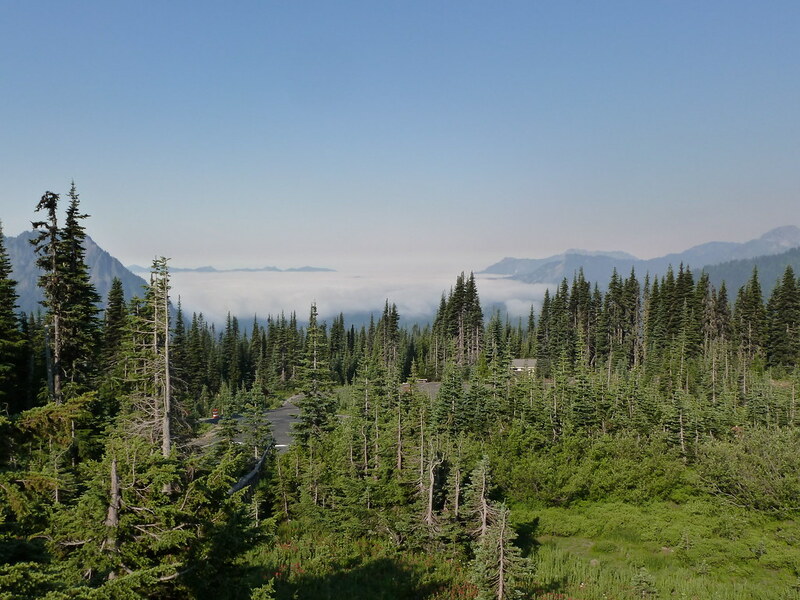 We had a final rest stop just above the cloud at Pebble Creek about an hour before we got back to Paradise. However, Paradise was not living up to its name that day. 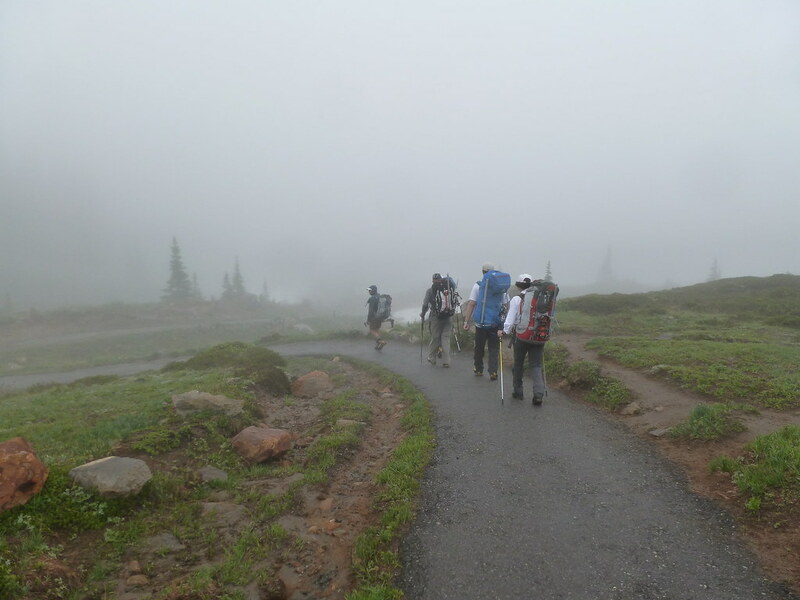 We dropped back down into cloud and drizzle. But I had a nice long chat with guide Steve who, remarkably, had recently been to Yorkshire. We were back to our bus for the return to Ashford before 3.30pm. And so we had a little get together at the Rainier Base Camp of RMI where certificates were handed out and email addresses swapped. It was a great adventure with like-minded people from around the US and me from the UK. Of course, we would not have succeeded without the skill and support of our guides – Brent, Steve and Katrina.